As the holidays draw closer, I’ve been trying to get a clean start of things. Get on top again, get my mind sorted out, and move forward with clean, clear steps. 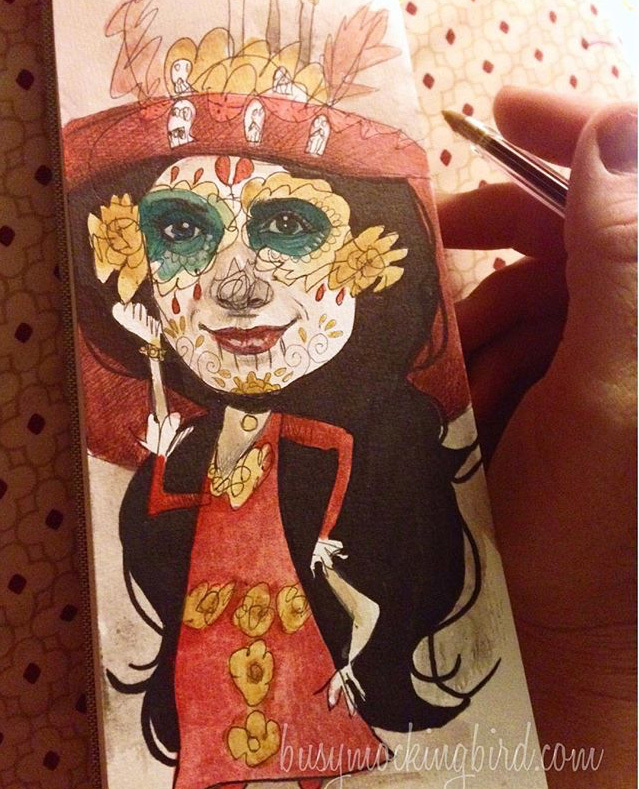 I’ve been loving these little tiny sketchbooks lately. Although Moleskines are my standard faves, these Ranger Dylusions are fun because of their shape, the little pocket inside, and the fact that I can draw on the covers (although the paper inside is meant more for inkwork and stamping, and doesn’t hold up well to much waterwork). 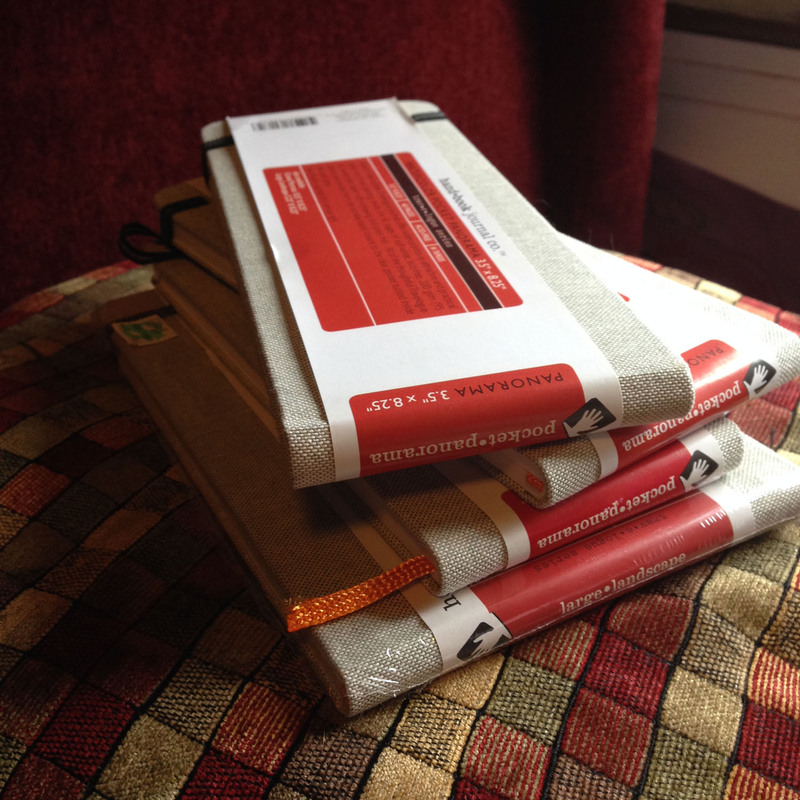 I get the 5″x8″ one, and it’s nice to be able to carry it around and have it with me wherever I go. The binding even has a spot to hold my pen! But what seals a sketchbook for me is being able to draw on the cover. 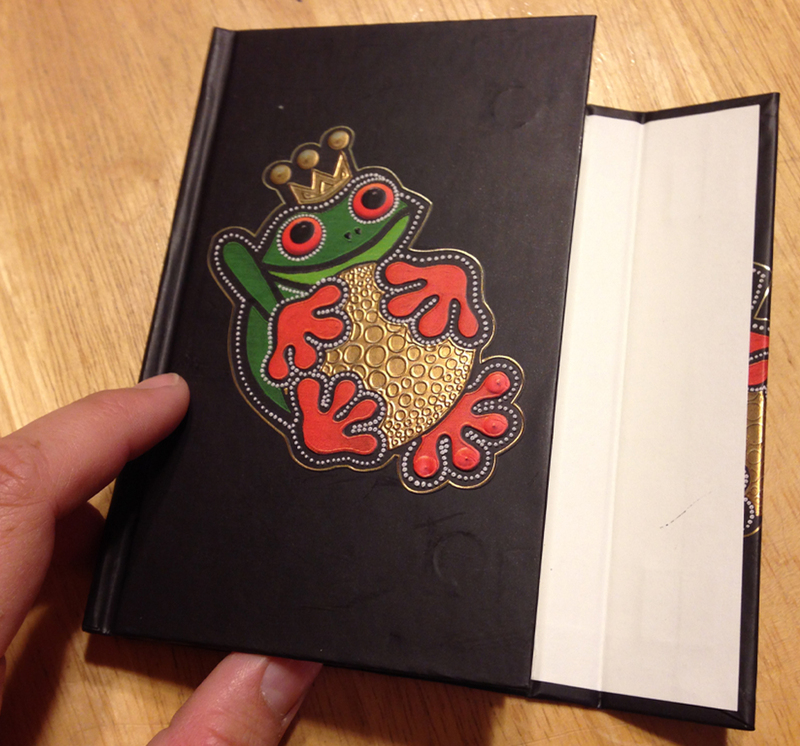 I used to spend countless hours (pre-child) giving meticulous thought and detail to the front cover of a new sketchbook. I overthought it–I had to be sure it was “exactly right,” as if it determined the future success or failure of the work it would soon have inside. Now that time is more limited and precious, I’ve had fun letting the daughter draw on them with me. I start with a roughly-drawn simple face, and she adds the rest. When I’m really pressed for time and anxious to start a new sketchbook, I turn to my collection of stickers I’ve amassed over the years. I LOVE stickers! 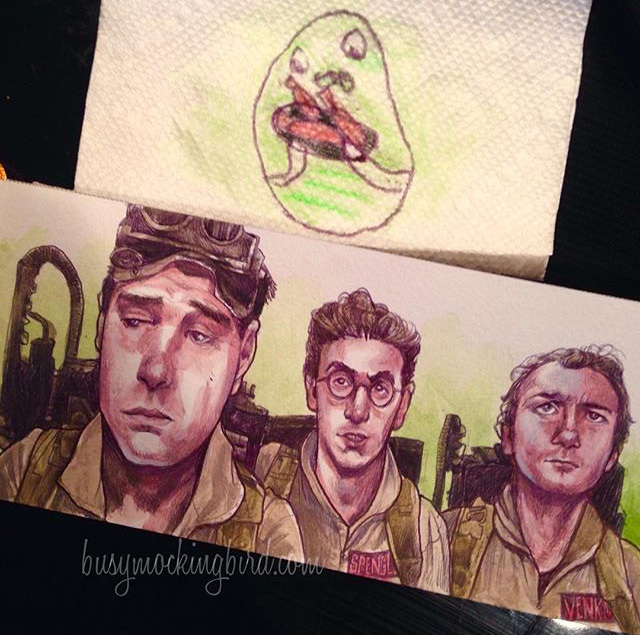 Friends send them, I have some of our own artwork. I even got a giant grab bag of mixed retro stickers from a seller on Etsy once. And to look at them makes me smile. I hear from people all the time, such humbling stories about the struggle of finally getting back into art after a long dry spell, especially after having a child. Maybe it’s not drawing, maybe it’s sculpting, or sewing, or music, or dance. Whatever it is, maybe it’s time to start fresh. Maybe you don’t have to start at the new year–resolutions can happen today. Open a new book and fill the cover with pretty things that invite you in every time you look at it! 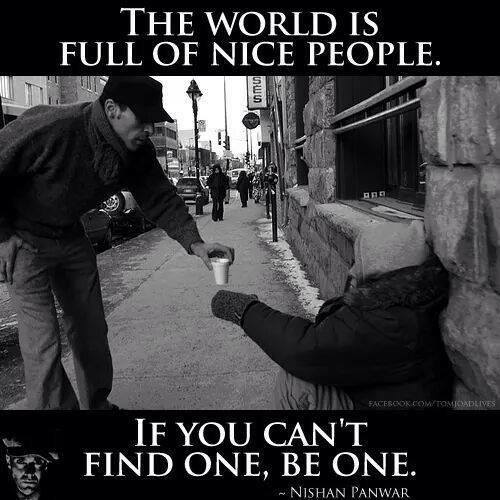 And if you do, share it with others, because in my experience, sharing helps. Sharing makes people feel connected, even from miles away. 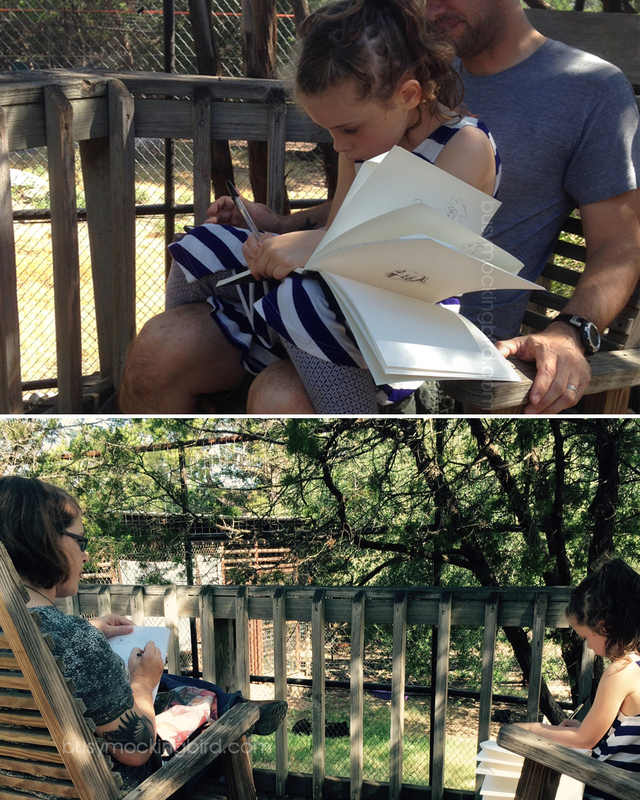 This week, while we waited for night to set in and the fireworks to start, Myla (she’s 8 years old now) asked if she could draw in my sketchbook. Along with the other doodles she found, she saw a portrait I had started of our Boston Terrier, Adie, and asked if she could finish it. And very carefully, she looked at the photo, doing her 8-year old best to copy what she saw. I mean, look at that little chest wrinkle!! EEE, it’s so cute! I told her that when you look at a picture to draw from it, it was called a “reference,” and that nearly EVERY artist uses references. She was hooked, and asked if she could draw our boxer, Scout. So cute! She was fascinated to know that things don’t always look like what you THINK they look like–dog noses aren’t always little triangles, for example. We talked about how that’s part of the fun of drawing from a reference, is to follow the photo to get it to look like what you see rather than what you THINK you see. Several times, people will ask me if I use references in my artwork, or if I draw it all from my imagination, and I tell them all the same thing: I don’t think I know a single artist that doesn’t at least START with references. The fun part after that, is changing things around to make it your own. References have always been a jumping-off point for artists, and while some artists strive to make their artwork photorealistic and EXACTLY like their reference, most only use them to piece together an idea they already have in their head. Myla even gave that a try, asking if I could show her the Alien she had seen somewhere (she’s never seen the movie of course, but I think they reference the queen alien in one of her goat simulator Ipad games). She asked if I’d show her references for the queen alien, and then drew the alien having lunch, while I told her the story of the entire movie. She asked if there were other aliens, and then added the Facehugger sitting across the table, and the Chestburster popping out of someone nearby (how embarrassing!). Humor is definitely a driving factor in this kid. If you were to browse the photos on my phone at any given time, you’d find tons and TONS of references–everything from movie characters, artists, animals, plants, flowers, and of course, TONS of photos of my favorite person to draw: Myla (thankfully, this doesn’t embarrass her yet, and she actually likes it. She said the other day, “I really love that you love to draw me.”). I have folders in my photos of beasties (animals to draw from), movie characters, Twilight Zone screenshots, plants, faces, you name it. Whenever I want to draw, I just scroll through my phone, and I’m never at a loss for something to play around with. I use references to draw from ALL the time, and it’s perfectly okay to do. I swear, when I was younger, I thought it was considered cheating. But how else would you learn how to draw without looking at something? On our long drive home the other day, I wanted to draw, and fought the bumpy road to doodle a photo I had of Myla, and turned her into a little mossy fairy forest sprite creature. 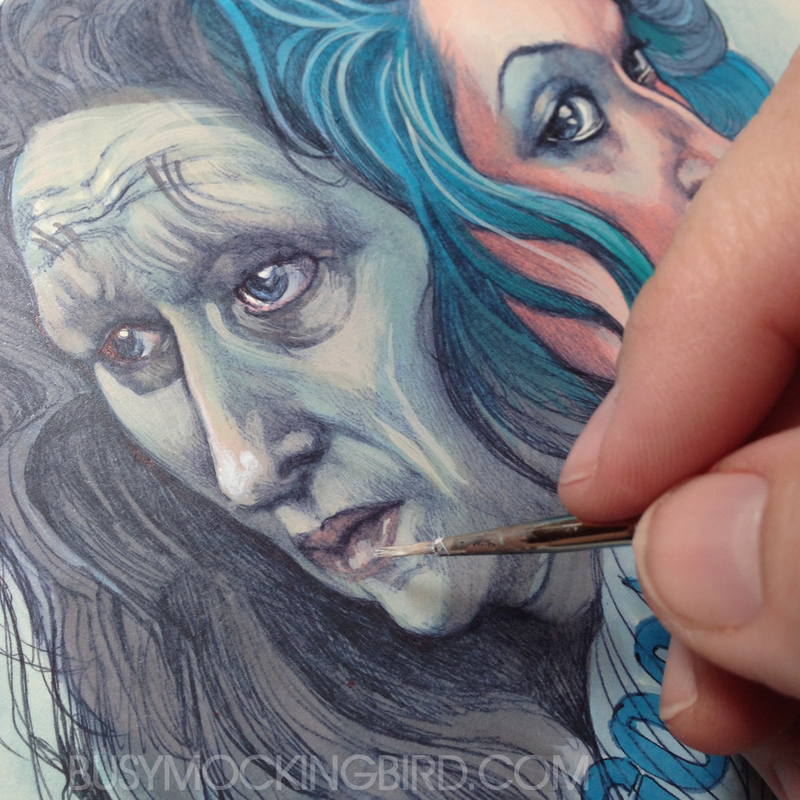 Later, I painted her in watercolors, all mossy and brown. I’m not done with her yet, but it’s a start. 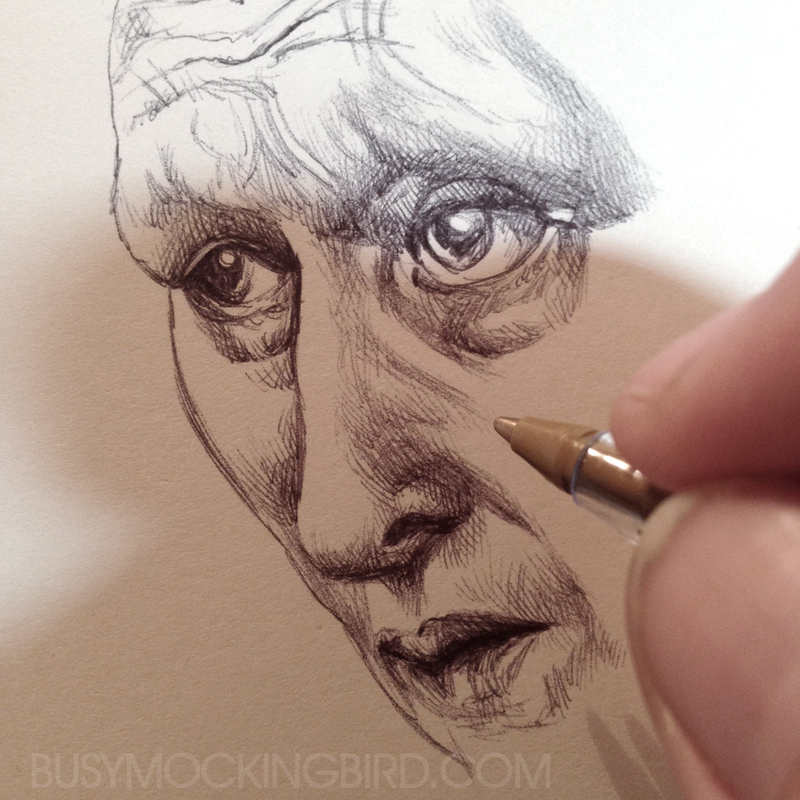 One time during a live stream, a person saw me using a rubbing stick to blend my lines with my graphite pencil and asked me, “but isn’t that cheating?” And I always found that funny, because…cheating? It’s a tool, a technique, the same way using oil to smooth fingerprints out of your sculptures is a technique. Whatever you have to do to get your idea or whatever’s in your head OUT. That’s the fun part! Have you ever looked at other artists’ media feeds, and just assumed that everything they touch turns out perfectly? I have. And aside from a few magical unicorns for which that may be true, I am pretty sure that all artists suffer from bad starts, and art block. Mine has been going on a while now….I’m not sure if it’s related to the fact that I’ve had a massive headcold that later turned into a sinus infection for the past three weeks, and has been totally clogging up my brain, but it sure shows in my sketchbooks, which are FULL of bad starts. The thing about bad starts, is that sometimes all it takes is the beginning of an eyeball for me to realize it’s not worth holding onto. And then I get discouraged about the bad start. 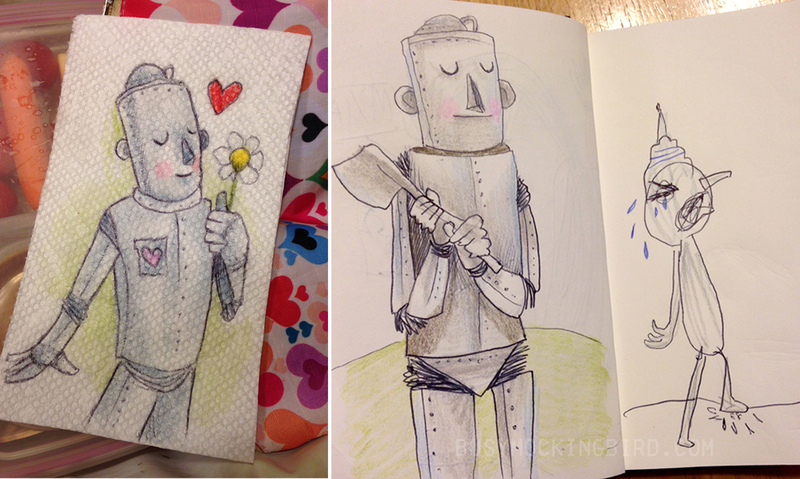 And feel bad for wasting paper in my awesome sketchbook. And then I feel like nothing I draw has been turning out right lately. And I start completely re-thinking my whole style and technique, and everything that has made sense to me in the known universe up until that particular moment, because WHAT AM I DOING I TOTALLY FORGOT HOW TO DRAW. 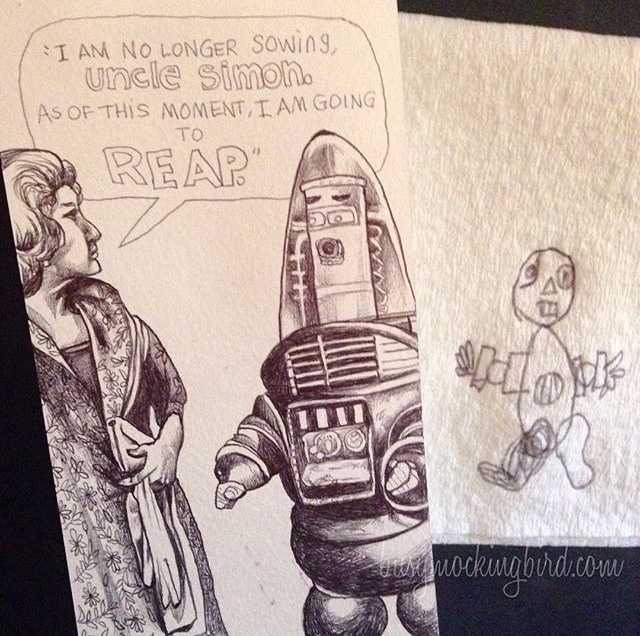 …And then a decent doodle will show up. It’s not GREAT, but it at least gets the idea out. Sometimes I go back to my comfortable spaces, where I feel the best, to try to pull something out from there. I always let Myla join me, because she always makes it better, and reminds me that it’s not that serious. And it takes some time, but then things start coming back around eventually. 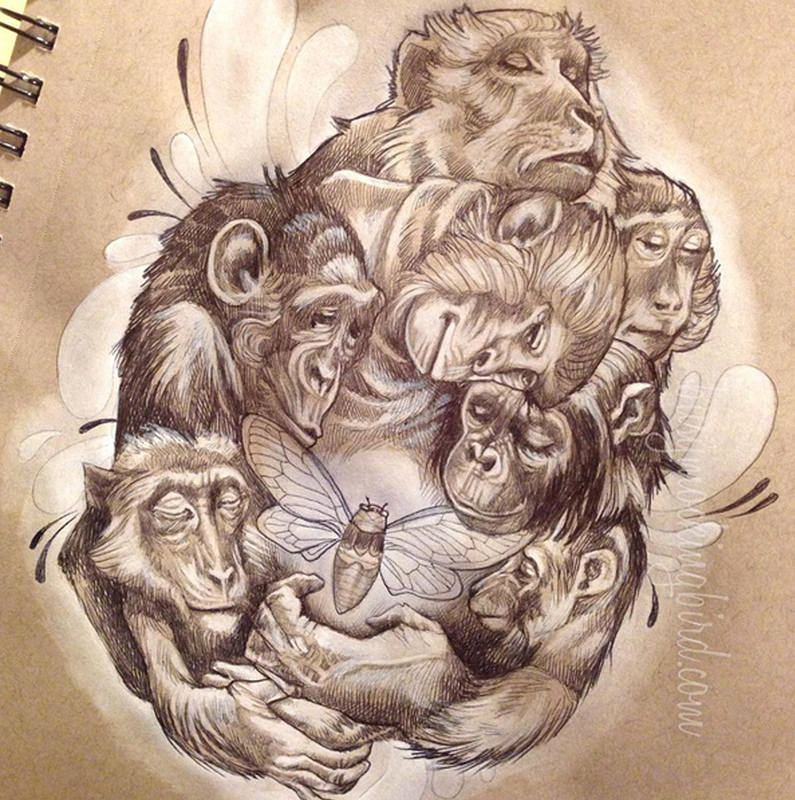 The thing to remember is that it’s part of who you are, when you have a passion like drawing. Whatever your passion is, you’d still do it if no one ever saw it, right? 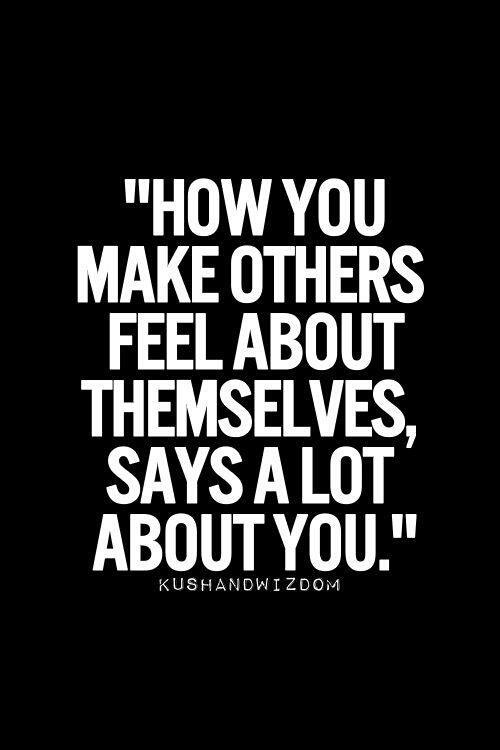 You do it because it makes you feel good. You almost NEED to do it. It’s not this yearning for a title, it’s not a status, but drawing is like skin to me, it’s just there, and I’m grateful for it. …So why does my confidence in it waver so much? If you struggle with the same things, try to remember what I keep telling myself: It’s not gone forever. It will come back, and you will be better for it when it does. If it takes a hundred bad drawings to get back to your groove, then by all means, start sketching! This past week, the daughter and I visited family for Spring Break, part of which included an 8-hour drive. Myla’s a great traveler, though, and can entertain herself for hours with a sketchbook, animation apps, or just staring out the window, daydreaming. 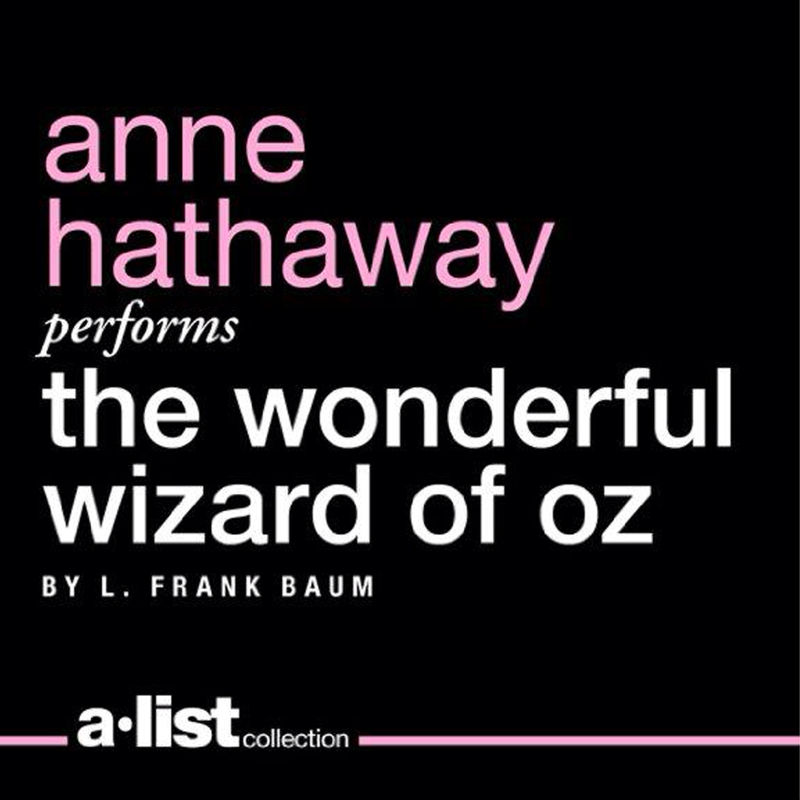 I had never tried her with audiobooks, but since the trip was long and she was tired of her normal car activities, I decided to play for her The Wonderful Wizard of Oz, read by Anne Hathaway. Anne has a knack for creating interesting voices for all the characters, which Myla enjoyed, and to my surprise, she was riveted, and was hooked right away. We happily learned that there were a great many differences between the book and the famous movie (of which she’s not really a fan), and was full of so many strange creatures and events that we had never heard of before. One of her favorites was near the end, when the adventurers come upon some people they called the Hammer-Heads, who had no arms, but very wrinkly necks, which could shoot out and punch you with their flat heads. And we started to sketch. 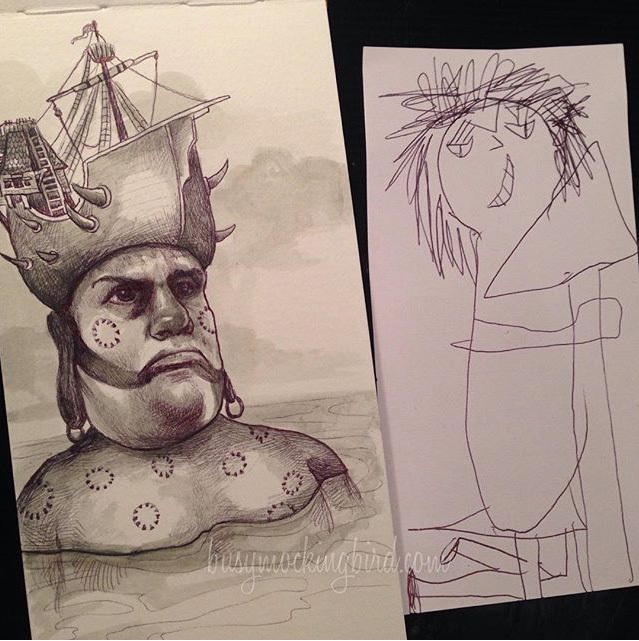 We drew them side by side, to compare. I pictured them more as rock people, and she saw them more like little cranky men. In any case, they both definitely had a wicked case of cranky-face. 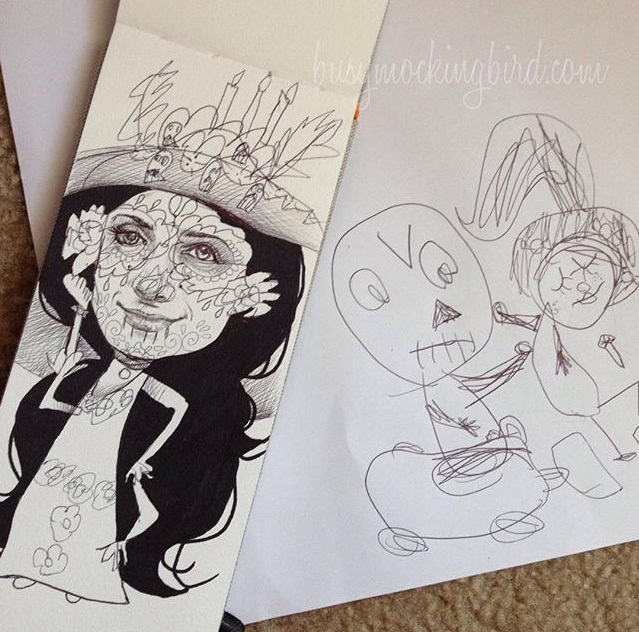 Next up, we drew the Scarecrow–Myla’s favorite of the travelers. I drew a little doodle on her lunch napkin that day, and when she got home, she sketched her version of the scarecrow being flung by the guard trees in one of the forests. I drew the Scarecrow in a quite disturbing description of how Oz gave him brains–by filling his head up with a lumpy mixture containing pins, which then stuck out of the fabric once his head was back on. They said it made his mind “sharp” (and not at all terrifyingly creepy in the slightest, right?). We both loved the Tin Woodsman (my favorite), whose story was MUCH more grim than in the movie. In the book, he was a regular man, in love with a Munchkin girl who lived with a mean witch, who enchanted his axe, which made him accidentally keep cutting off his own goshdarn limbs. Luckily, his good buddy the Tinsmith would replace his limbs with tin ones each time, until finally the Tin Woodsman cut off his own head and body with the enchanted axe, and the Tinsmith fashioned him a new one…but it didn’t have a heart, and he no longer was able to feel love, even for the little Munchkin girl….until Oz cut a little square in his chest and put a tiny fabric heart inside, and he finally felt love again. I drew him on her lunch napkin, and then later, holding his axe (with which he chops a GREAT many messy things in the story) and Myla drew him feeling sad, crying over accidentally stepping on an insect. The Lion seemed to us just like a regular lion, and we talked about how in the movie they kind of made him like a person, standing on two legs. Hers was a little more goofy -faced than mine (since he was quite silly), and mine is drinking the liquid courage (which I assume was probably a shot of whiskey or whatever?) that Oz gave him. Dorothy was also quite different. Myla saw her as a little blonde-haired girl in a blue dress, and we were both surprised to know that in the book, those famous ruby slippers were not in fact “ruby,” but were SILVER, a-thankyouverymuch, and never ever contained a bit of red. When the house lands and she’s about to take off on her adventure to find the Wizard who might help her get home (which she heard about from a woman who was NOT Glinda, but an older small, hunched wrinkly woman, who was indeed a Good Witch), she puts on a blue gingham dress, the silver shoes, and a yellow bonnet, which I supposed she wears for the entire trip… Since that blew my mind, I scrapped my childhood image of the iconic Dorothy, and drew her with shorter, curlier brown hair. Myla and I both saw Toto pretty much the same, which makes sense, since they described him pretty well. We haven’t yet drawn my favorite characters, the Flying Monkeys…but I was surprised that their story was MUCH different in the movie, where the Witch just bossed them around all the time, whenever she wanted. In the book, there is a golden jeweled cap that the Witch puts on, says a goofy little chant, and the monkeys come do whatever she commands. The catch is that the wearer of the cap can only call the monkeys three times (she’s already called them twice), and then the hat must be passed on to someone else. So when the Wicked Witch sees the travelers in her country, she sends…the WOLVES to go hunt them down. 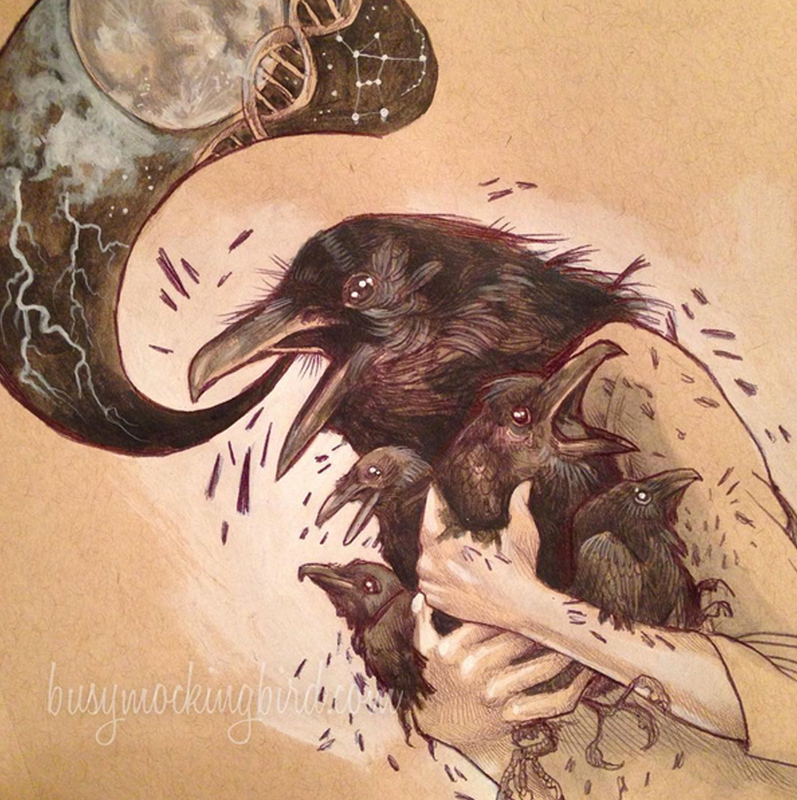 When that doesn’t work, she calls the CROWS. Then the BEES. Then the WINKIES. (wait, what? “Where are the goshdarned monkeys? ?” I was thinking at the time). Finally, when all of those are defeated, she decides to use her last and final monkey-call to attack them. …So there it is! What started as a simple way to pass the time on a long road trip turned out to be a pretty fun project for us both. I’m pretty happy about how much she got into it! I had nearly forgotten that when I was in high school, I had an AP English assignment to do a paper on imagery from the book One Flew Over the Cuckoo’s Nest, and I drew each character as I had seen them in the descriptions I read. It had always been one of my favorite assignments, and I had nearly forgotten about it until Myla came up with this one. We’ve read a few actual chapter books at bedtime, like the Spiderwick Chronicles (of course), Charlie and the Chocolate Factory, Fantastic Mr. Fox, James and the Giant Peach, How to Train Your Dragon, and The Phantom Tollbooth, to name a few–ALL of which would probably be amazing for this project. I think the key is finding out if your kid’s into it first. Last month, as if I didn’t have a million other things going on, I decided to join in on Inktober. Have you heard of it? I had seen artists do this last year: a drawing a day for the month of October, usually spooky-themed, and usually done in ink or pen. And just because I wanted to make it a little more fun, I asked Myla (the 6-year-old) if she’d like to join me. This was a challenge because 1) I wasn’t sure if she’d be able to keep with the theme for the whole month, and 2) it sort of limited what I drew, as I had to sort of keep it within something that fit both of us, and wasn’t TOO creepy for her. I made my own rules, so it didn’t feel like pressure: if I wanted to add color, that was fine, and if I didn’t get to it one day, I wouldn’t stress it too much. But Myla was already full of enthusiasm, so we got started. Day 1: VILLAIN. 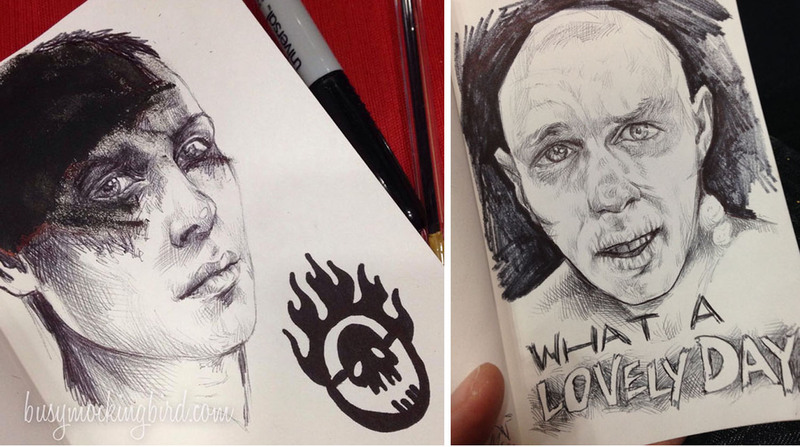 Elle Driver from Kill Bill, and Megamind (who’s she said is special because he’s a villain who turns nice). Day 2: BEETLEJUICE. This is one of those characters that she didn’t really know, because she’s not so into creepy things…but with things like that, I tell her about them, and she gets the jist. My Beetlejuice is wearing a shirt of a guy named Beetlejuice from the Howard Stern show, and hers is the cartoon version, holding beetles in his hands. Day 3: WITCH. Bellatrix LeStrange from Harry Potter, and the Playmobil witch from a show Myla likes called Super4. Day 4: SKELETON. A “real-ish” LaMuerte from Book of Life (with Myla finishing the body) and Turbo fighting Vanellope from Wreck-It Ralph. Day 5: WEREWOLF. Old school Teen Wolf and Aisling, the little wolf-girl from Secret of the Kells, who’s sniffing another girl…like ya do when you’re like a dog. Day 7: WEDNESDAY ADDAMS. It was a Wednesday. It was another character she didn’t know. I used to LOVE the old Charles Addams drawings as a kid, and devoured his books and drawings. I told her about the movie characters, which cracked her up (especially Thing). Day 8: HELLBOY. Again, I did NOT let my 6-year old watch Hellboy, but she’s seen him around (especially at conventions), and always liked the fact that he’s a good guy who was supposed to be bad but CHOOSES to be good…and she really digs that he loves cats. Day 9: VAMPIRE. 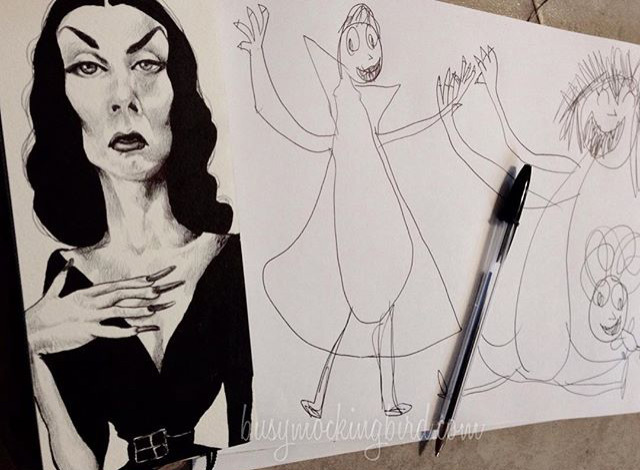 I drew Vampira–and here’s a little trivia break: I learned that she created the character and hosted a show of horror films in the 50s and added campy comments to them. In the 80s, studios wanted to recreate her show, but cast the actress who now plays Elvira in her part, pulling her look and the style of the show directly from hers. 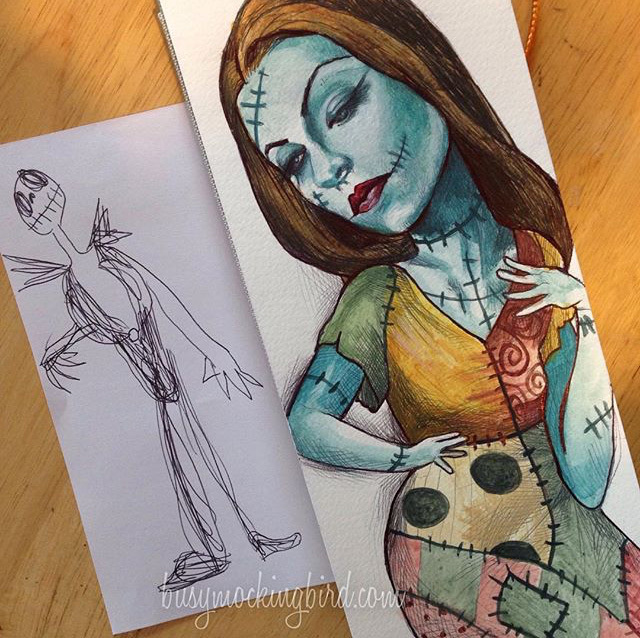 Since she created the Vampira character (based loosely on Charles Addam’s Morticia drawings! ), she tried to settle in court but lost. Strange, the things you learn, when looking up references. 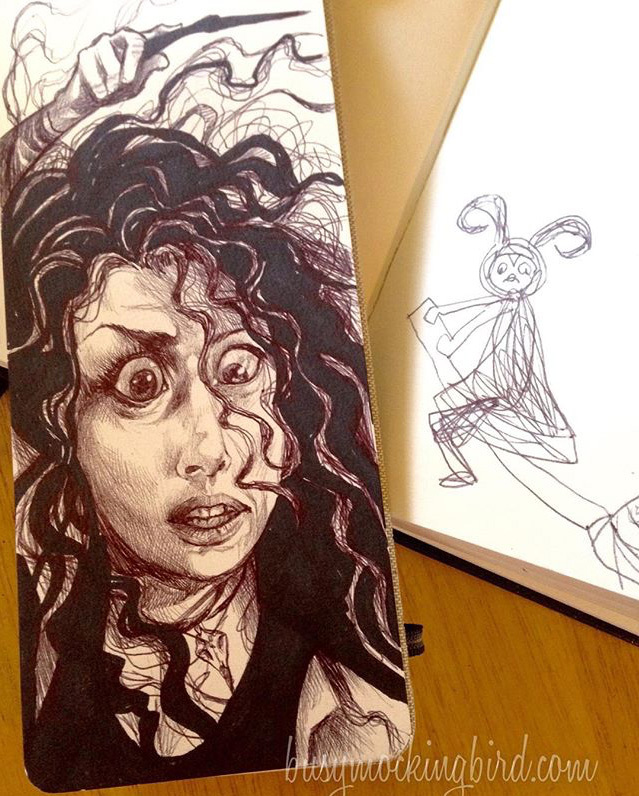 Aaanyway, for Myla’s piece, she drew Drac, Mavis, and the curly-baby from Hotel Transylvania. Day 10: SWAMP CREATURE. 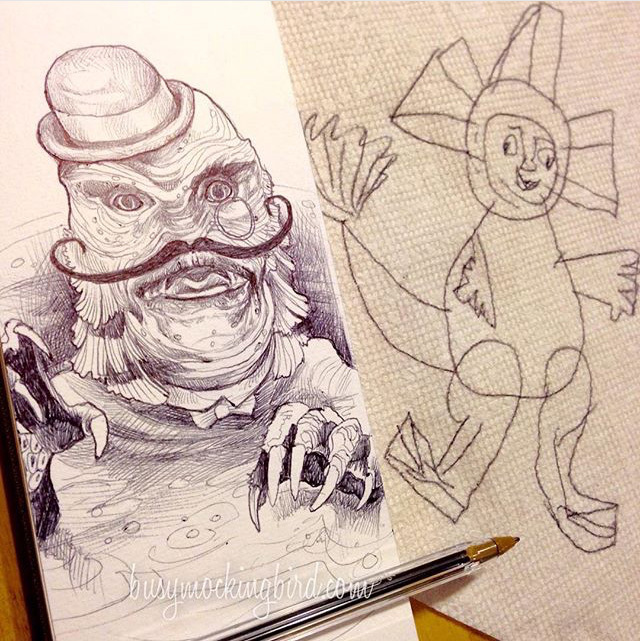 Old-school (and quite dapper) creature from the Black Lagoon, and the Missing Link from Monsters vs. Aliens. Day 11: ALIENS. 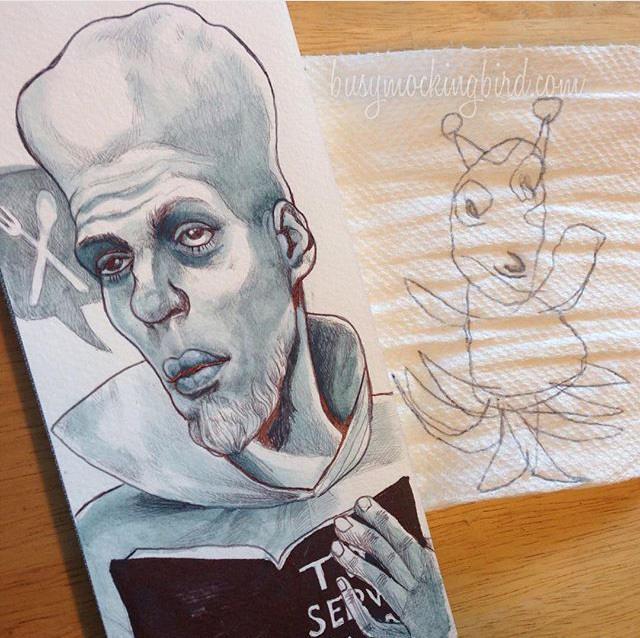 My very favorite Twilight Zone episode “To Serve Man,” and a tiny Gallaxhar from Monsters vs. Aliens. Day 12: ROBOTS. (Can you tell I love Twilight Zone?) Uncle Simon from a creepy episode of the ‘Zone, and a sweet little C3PO (even including his silver leg! Aww.). Day 14: ZOMBIE. This one was tricky, since they’re one of Myla’s absolute creep-outs. So I tried to keep it harmless with Michael Jackson from Thriller (she even liked the video, although I didn’t show her the full beginning skit). 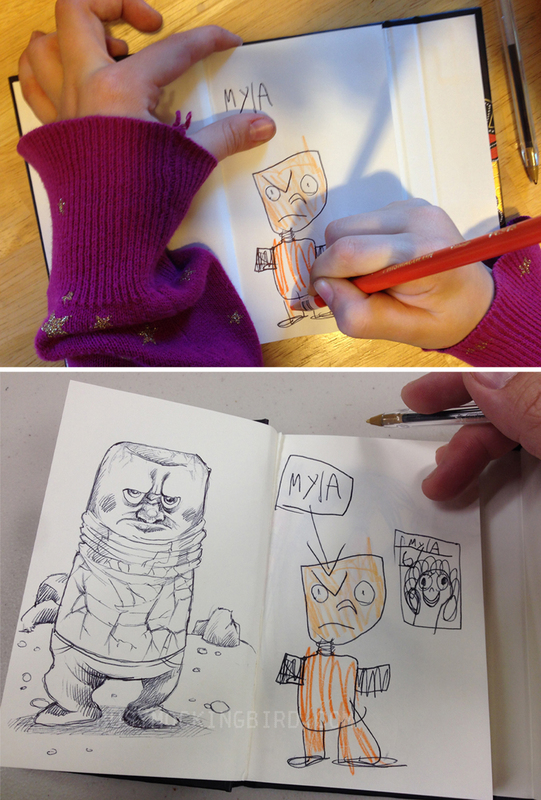 She drew the zombie “Bad Guy” from Wreck-it Ralph. 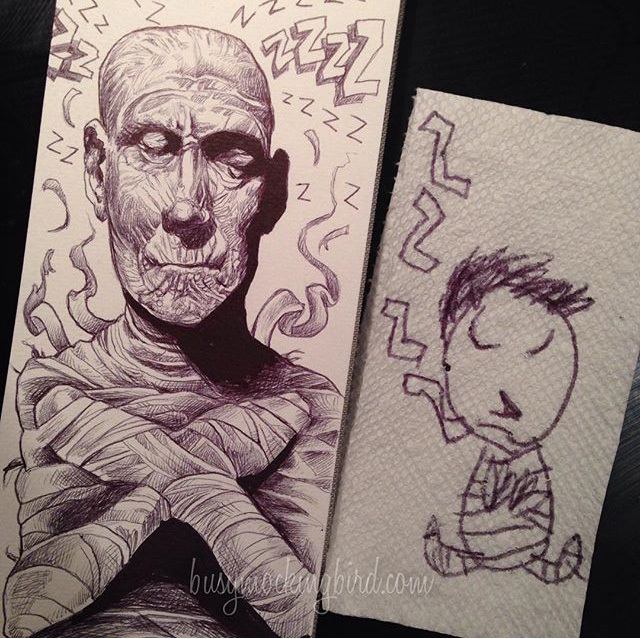 Day 15: MUMMY. Myla has a thing for mummies–they fascinate her! She even has a bedtime book on the whole ancient Egyptian embalming/mummification rituals (yeah, for some reason, THAT doesn’t freak her out at all! Haha!). Old school Karloff and Akhmenrah from Night at the Museum (she has a little crush on him), both catching some Zs. Day 18: CREEPY SMILE. 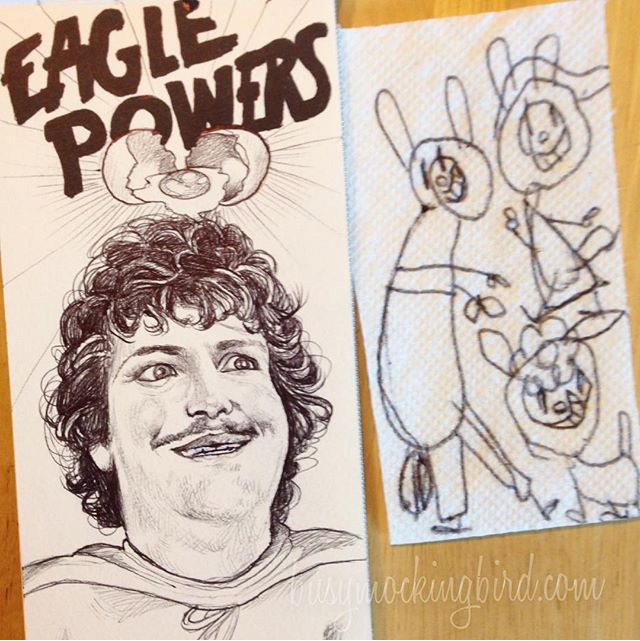 Really just an excuse for me to draw a goofy Nacho Libre smile, and for Myla to draw the Animaniacs. 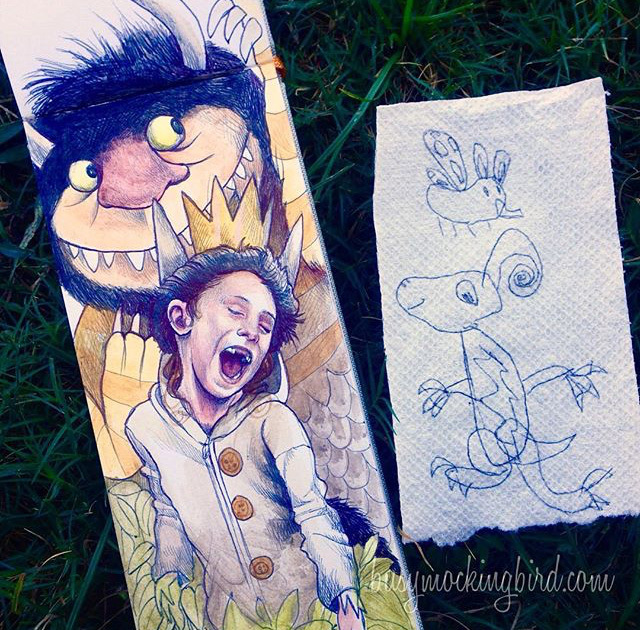 Day 19: WHERE THE WILD THINGS ARE. I had initially planned on drawing the kid from the movie, but then remembered I had once made her a Max Halloween costume when she was 2 or 3, and decided to draw her now, as a wild thing, roaring her terrible roars. 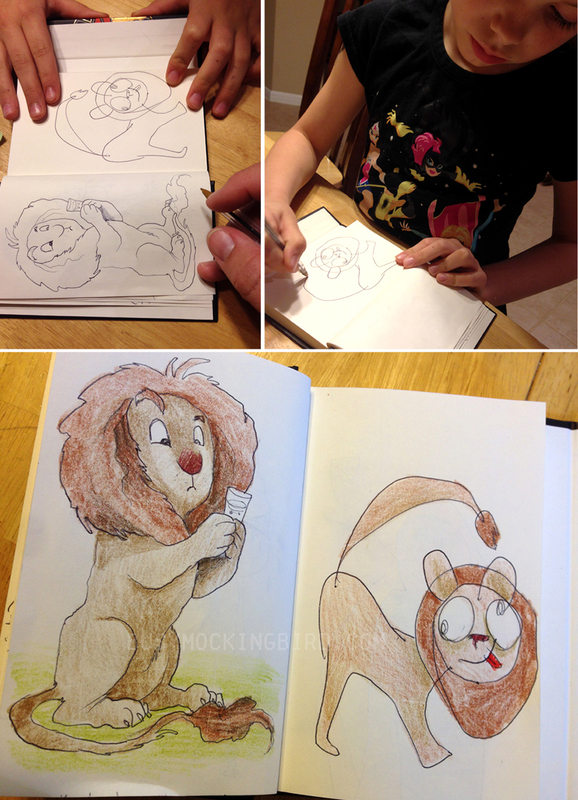 She drew the goat-one…plus a flying wild thing she made up. Day 21: QUEEN OF HEARTS. 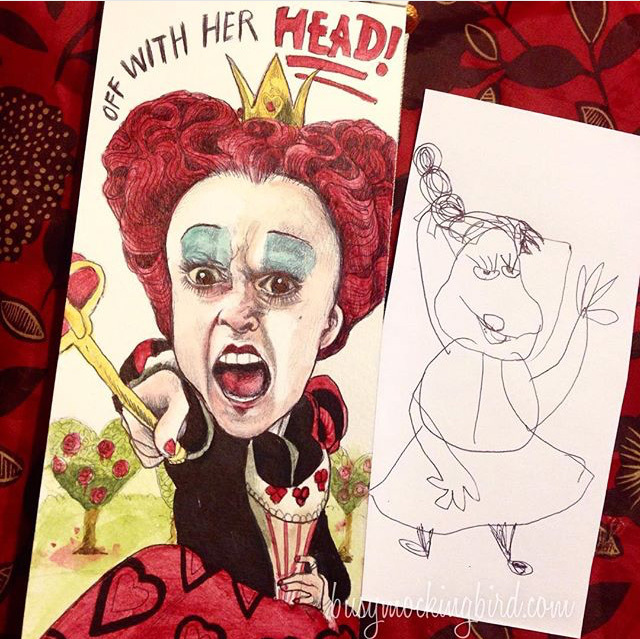 We’d just been reading “Through the Looking Glass” at bedtime, so we thought the Red Queen would make a fun topic. From the movie, and from the Disney cartoon. 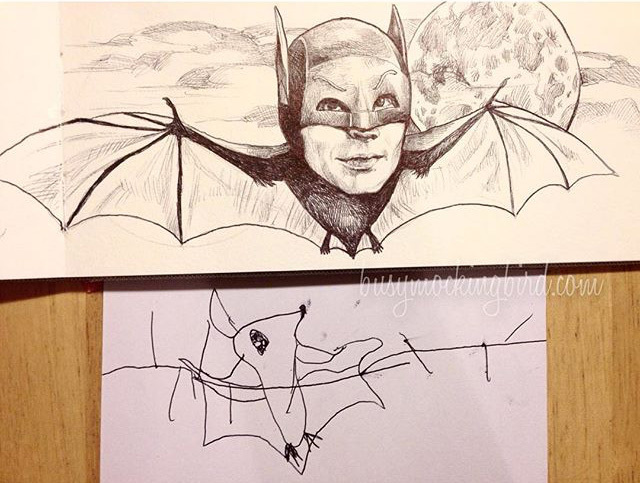 Day 22: BAT. An old-school Bat…man, and Stellaluna. 23: NIGHTMARE BEFORE CHRISTMAS. A handsome Jack, and a real-ish Sally. 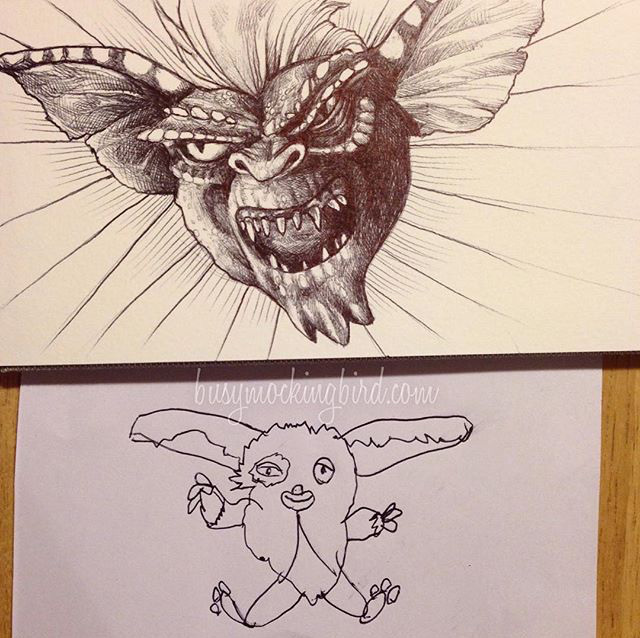 Day 24: GREMLINS. 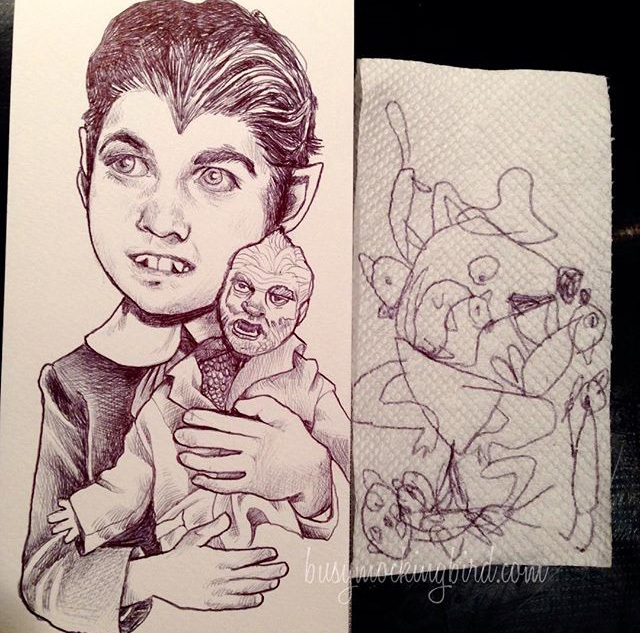 Myla once fell in love with a Gizmo doll she got in a gift shop, so I drew Spike, and she drew the cutest little Mogwai. Day 16: Another FRANKENSTEIN. 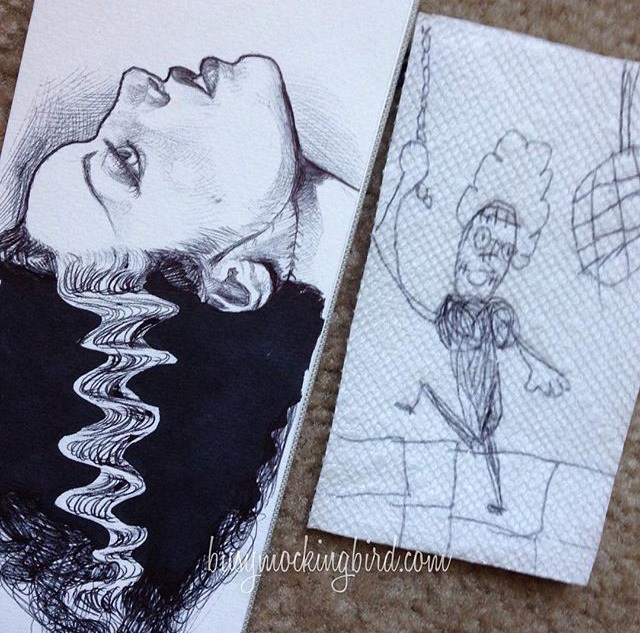 Bride of Frankenstein, and Johnny Stein from Hotel Transylvania, pulling down a disco ball. Day 27: GIANT. The ship-giant from Time Bandits (one of my all-time favorites), and the lady giant from Into the Woods, tearing down trees. 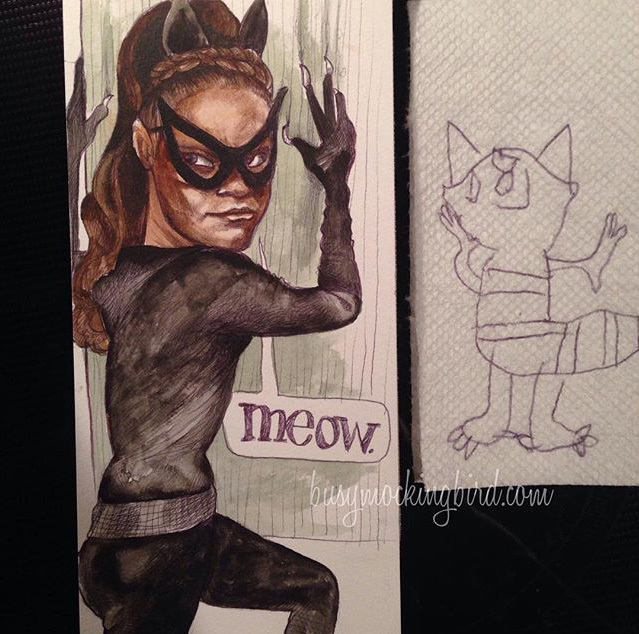 Day 28: CAT. Old-school Cat…woman, and the Cheshire Cat. Day 29: GOBLIN KING. 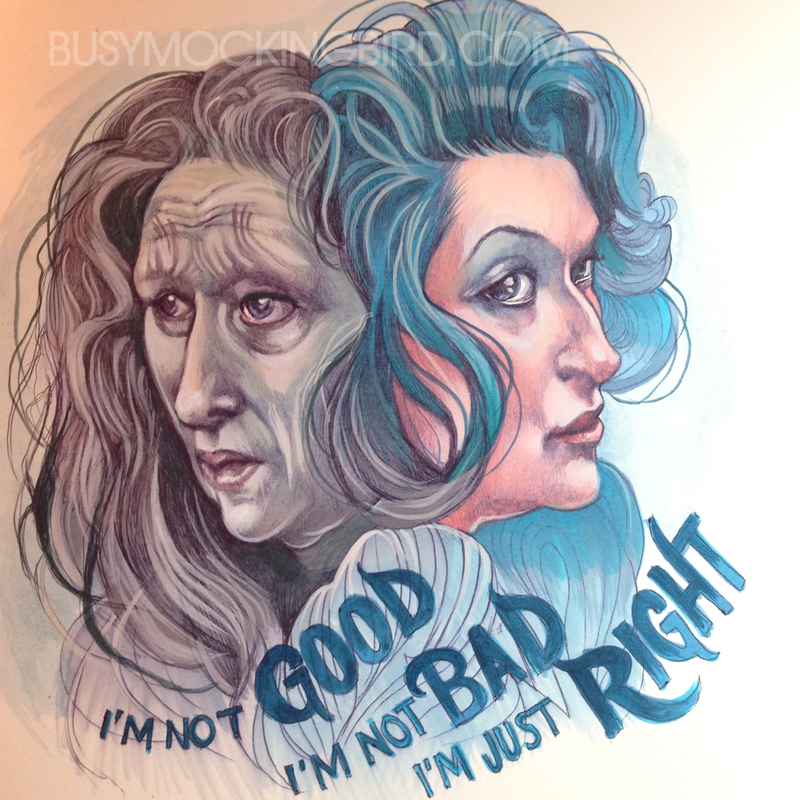 We both love the Labyrinth. 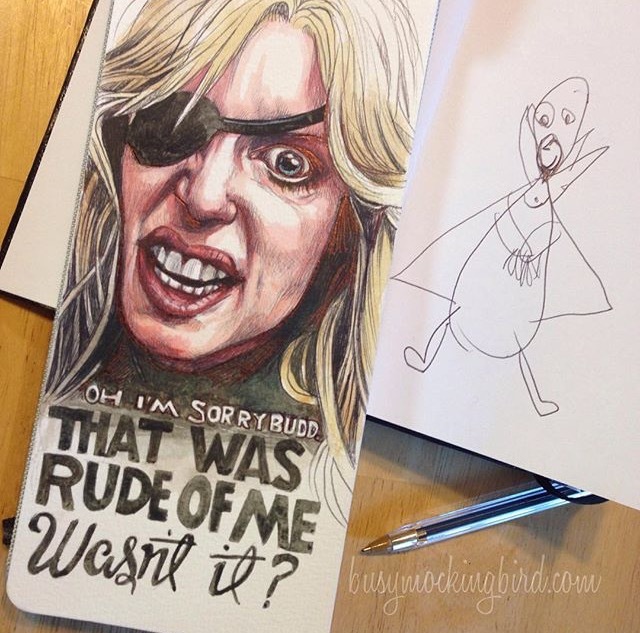 I drew Jareth and his goblins. 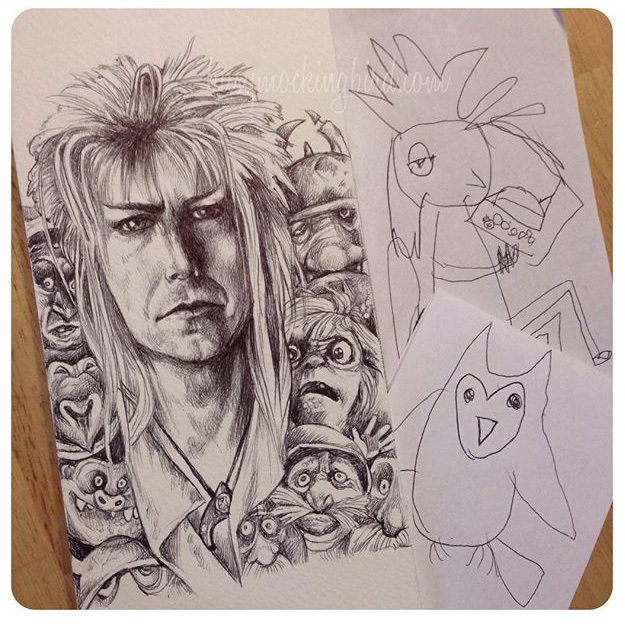 Myla drew an “inappropriate” Jareth on the toilet (because bodily functions crack kids up)…then added another, drawing him when he transforms into an owl (so I couldn’t help but post them both). 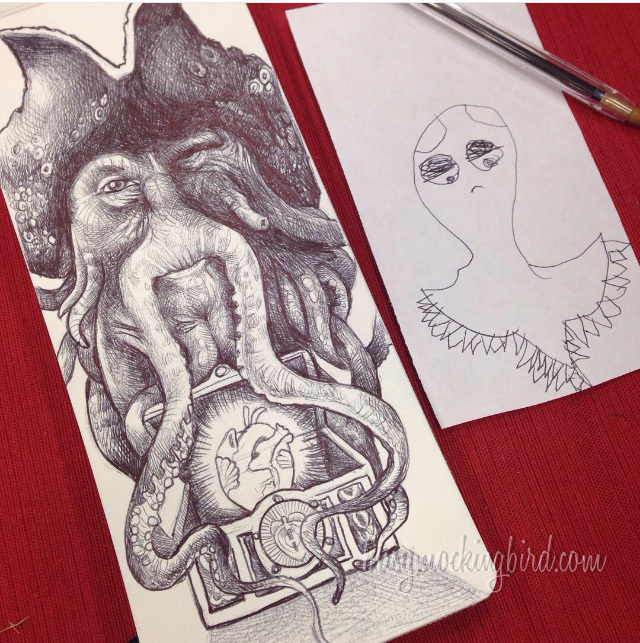 Day 30: CREEPY OCTOPUS. A category she completely created, because she wanted to draw a vampire octopus from Octonauts. This one stumped me for a bit, until I remembered the COOLEST “creepy octopus” of all: Davy Jones from Pirates of the Caribbean, with his heart chest. Day 31: DRAGON. Admittedly, we were at the convention in Austin and couldn’t really go out with a bang, but hey–we tried! 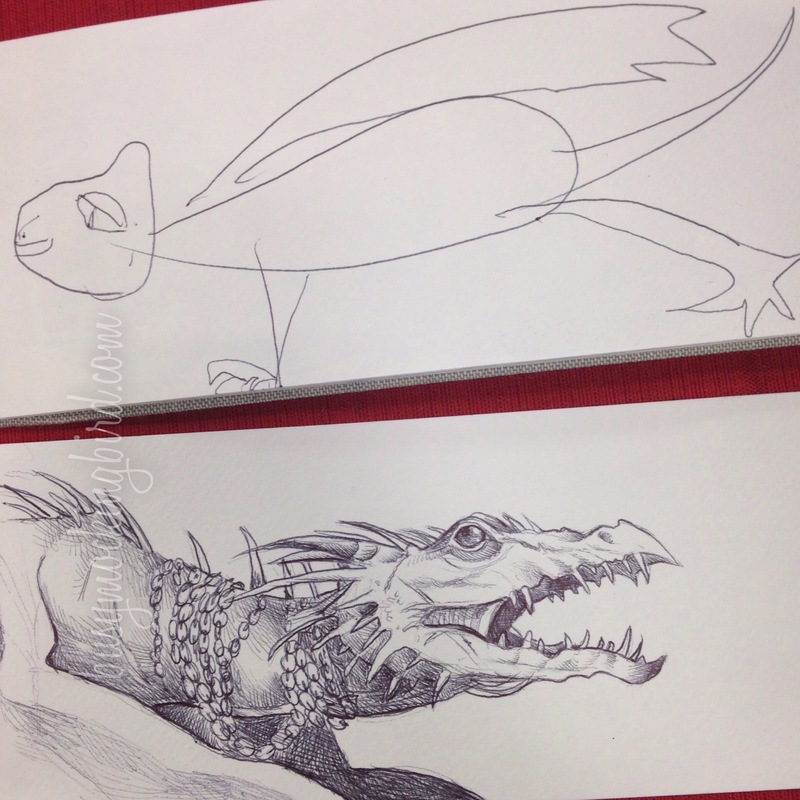 Myla drew a “rain dragon” (which is how she describes drizzly days), and I drew the sad little Gringott’s dragon from Harry Potter. So there we are! A drawing a day for October. And honestly, Myla was the motivator the whole time, asking me excitedly every morning, “what’s our drawing of the day today?” We both picked the topics–she was so good at coming up with themes that we both could do. Anyway, I hope you all had as fun an October as we did with Inktober! 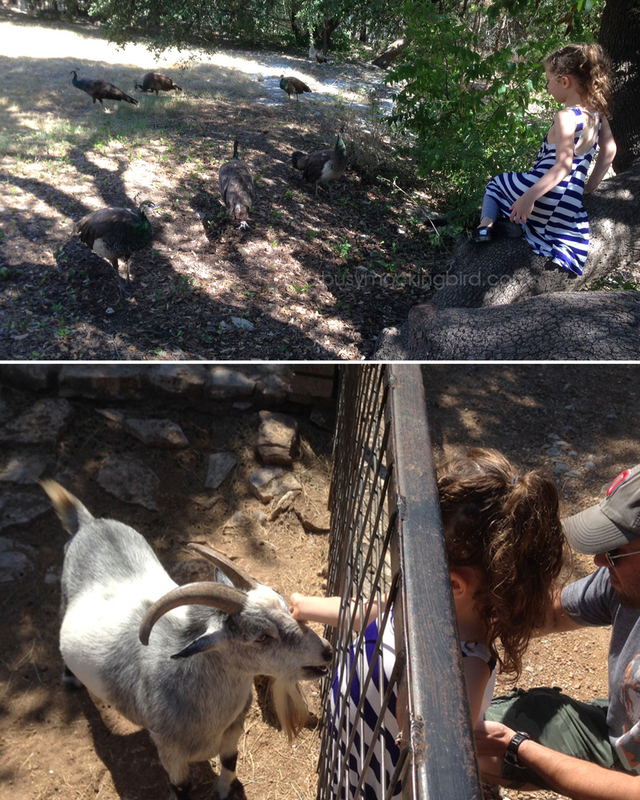 Since things have a way of keep on keeping on, I’ll share with you some good times we had at the zoo a few months back. You guys, Texas is hot. I don’t know if you’ve heard, but it’s really hot. It’s the kind of hot that makes me never want to leave the house. 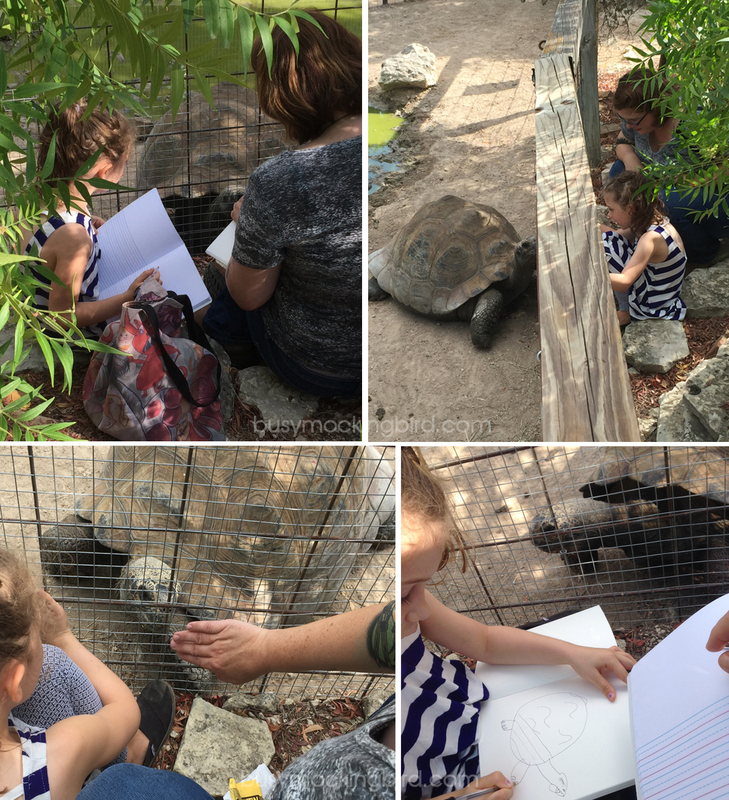 But one weekend, the husband & I heard it’d be a bit cooler that normal (a tiny bit less than “sweltering”) and left the house early to take Myla to the Austin Zoo. 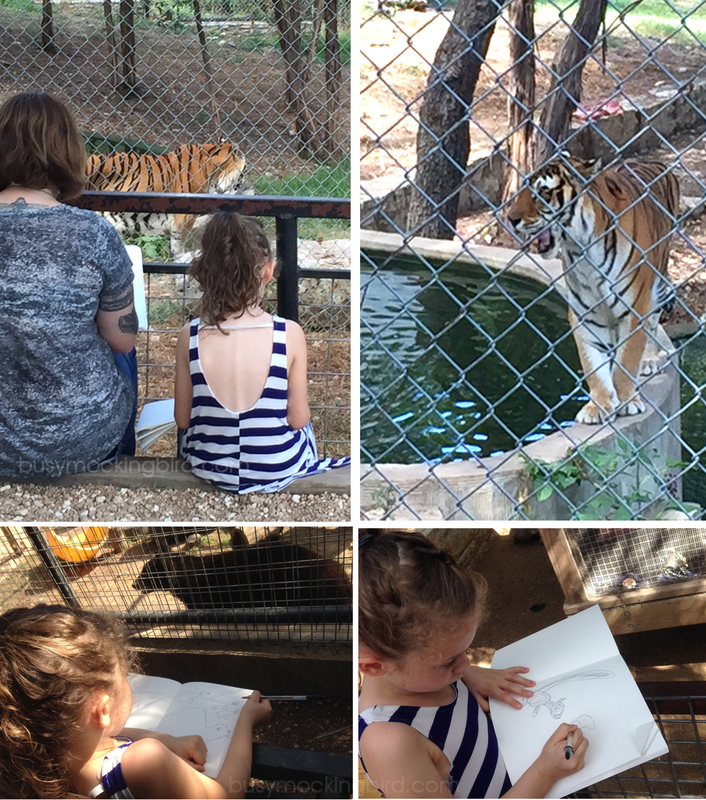 I like the Austin Zoo because it’s a rescue center, and it’s so small that you can get pretty close and personal with the animals there. 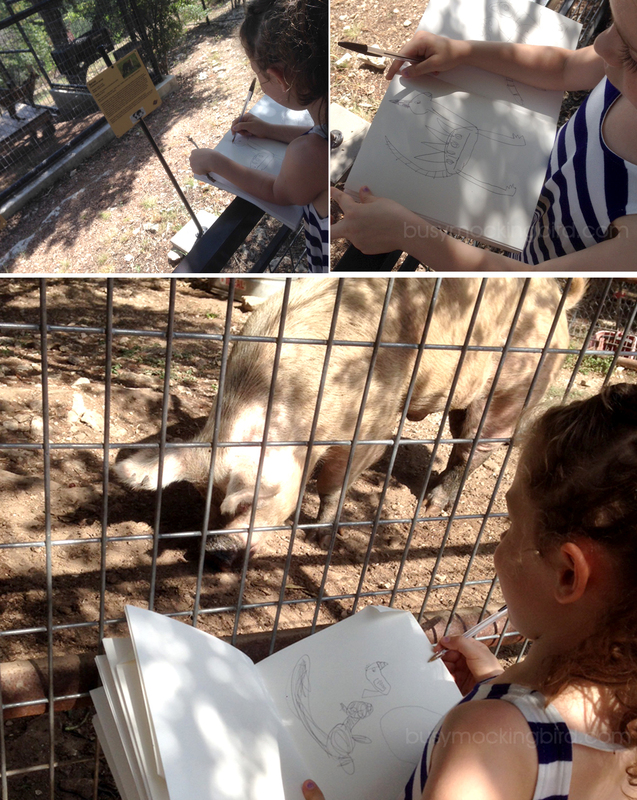 Ages ago, I suggested to Myla that we bring our sketchbooks on a zoo trip. We did, and we had a great time. She remembered that this time, and asked me could we please please bring our sketchbooks again? And, since I really really love when she asks me for easy things, I said yes, of course we could. Myla and I sat there for quite a while, politely sketching him (or her). We complimented him (or her) on its shell and all of it’s lovely bumpy skin. The tiger was out, totally passing up her pile of meat to come over and check us out…and then sauntered over to a shady area for a nap. 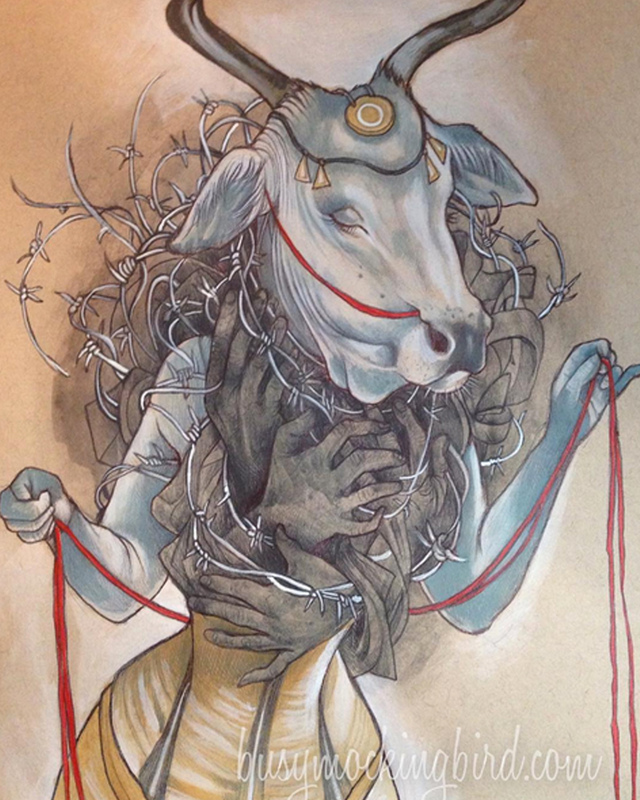 Most times, collecting the animal wasn’t as important as using it to create something else. When we found the serval, she gave it spikes and a dragon tail…because: REALITY. And we also took time to put the sketchbooks down a bit and look around at all the beautiful things, and enjoy just being together. …And then it got really really hot, and we went home. But hey–you’ve got to find smiles in the little things! Those little things are truly what leave the biggest memories. And it doesn’t have to be the zoo–It can be a walk down the street, kicking rocks and catching grasshoppers. It can be the crunch of leaves with each step on a walk through the forest. It can be in your backyard, drawing daisies, or splashing paint on paper. You can try it right now! You can try it when the kids get home from school. You can try it alone, or with a friend. Before anything, I want to tell you all how very much I appreciate all the wonderful comments I got on my “Pause” post last week. I was sincerely overwhelmed by all the support out there! Each and every comment was like a splash of fresh water in the middle of a marathon. It felt like smiles from new friends. It felt like a hundred hugs through my computer. People can be awesome, and there’s nothing more awesome than people being awesome to someone they don’t even really know. 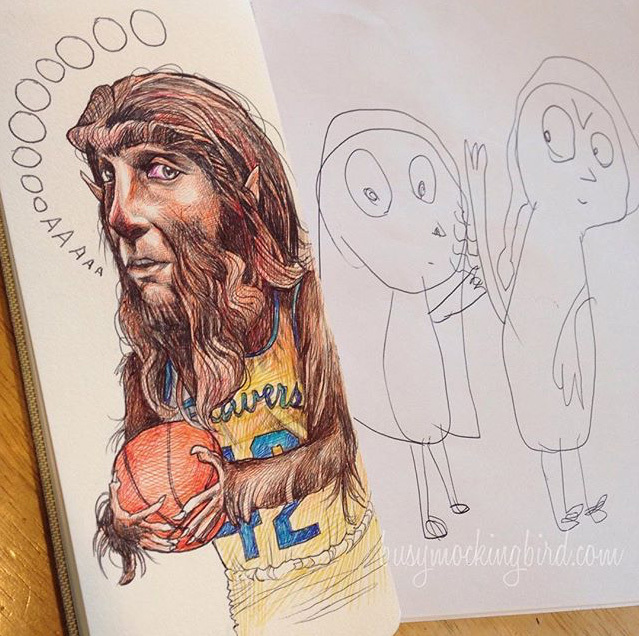 For me, when the going gets tough, the tough get….drawing. And I have been drawing a lot. I wish I was the type of person that obsessively worked out and got super buff in times of stress, but I’m not. 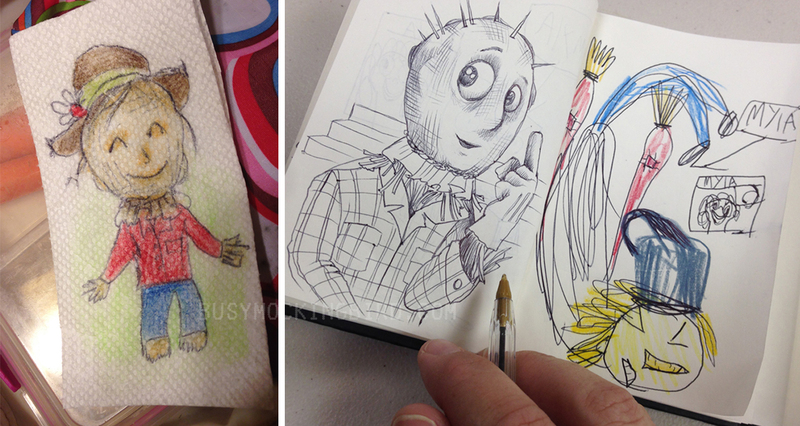 I’m quite squishy….because instead, I bury my head in sketchbooks, custom work, random doodles, and projects with the kid. So I’ve been drawing a lot. I’ve been working my regular job and taking care of my regular things, getting ready for a convention in Austin at the end of October, fulfilling custom portrait orders, and dealing with everyday things, and I fill every space in between with sketches. 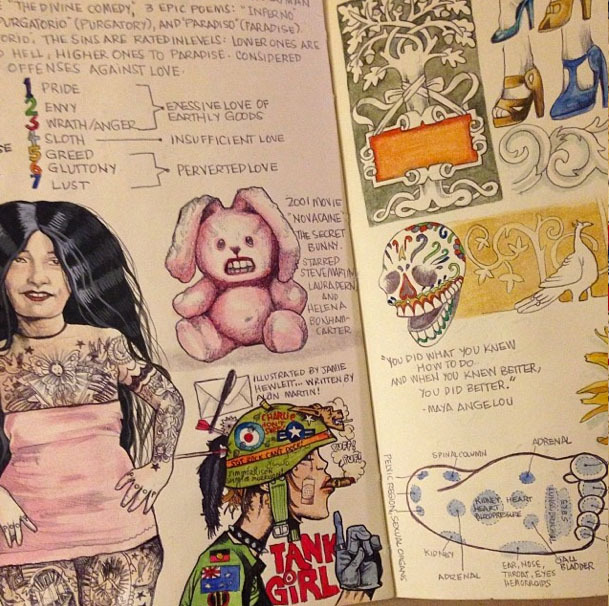 Similar to Drawloween, Intober’s subject matter is wide open. 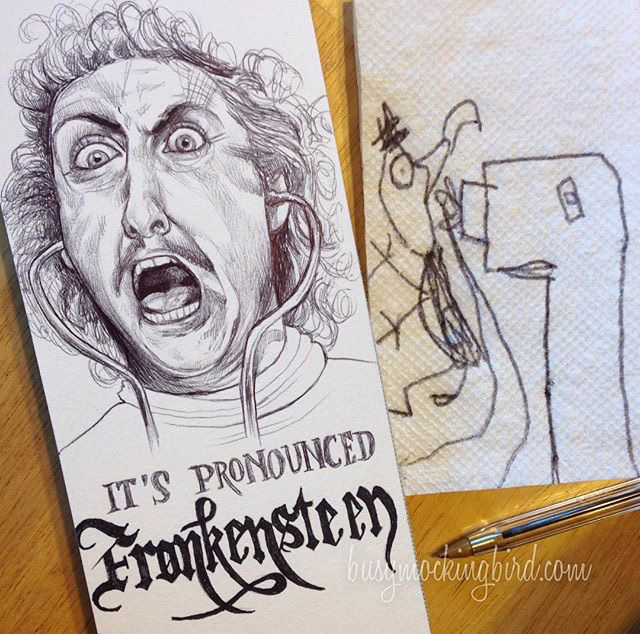 Some people have made posts with halloween-related topic suggestions (like “pumpkin,” “vampire,” “frankenstein,” etc), and some of my artist friends have made their own lists of subjects (BreakfastJones puts her own topic out every day if you want to follow along with her). Day 1: Villain. I chose Daryl Hannah as Elle Driver in Kill Bill, and Myla chose Megamind. Day 2: Beetlejuice. 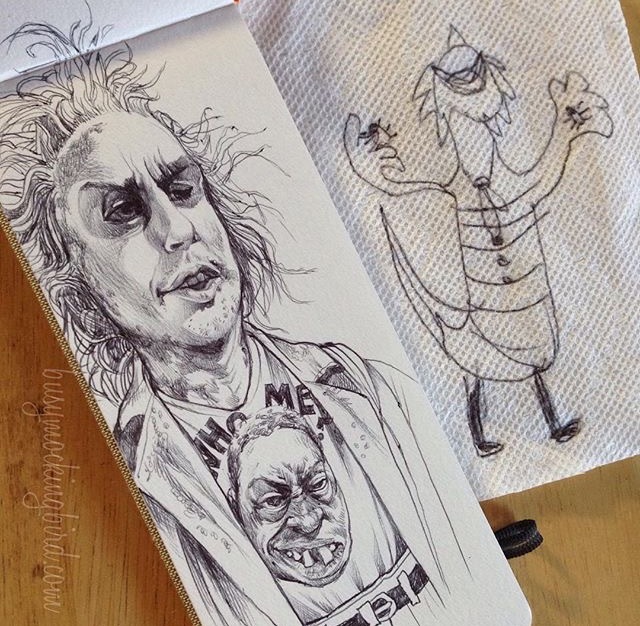 I drew Michael Keaton as Beetlejuice, wearing a shirt of Beetlejuice (from the Howard Stern Show), and Myla drew Beetlejuice with a snake-tail and bugs in his hands (she’s never seen the movie). Day 3: Witch. 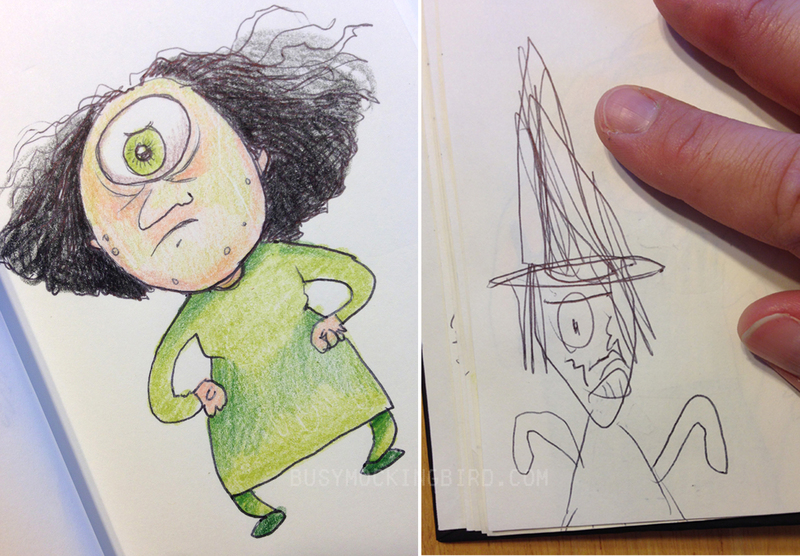 I drew Bellatrix Lestrange, and Myla drew the witch from one of her favorite Playmobil shows, Super 4. 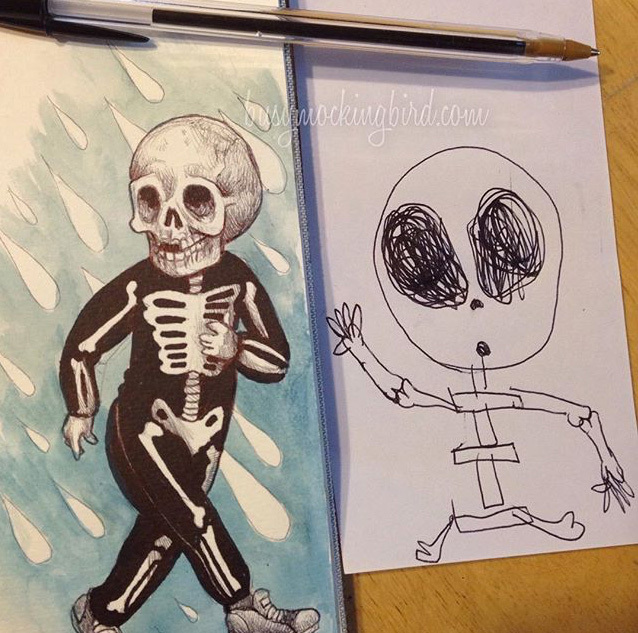 Day 4: Skeleton. 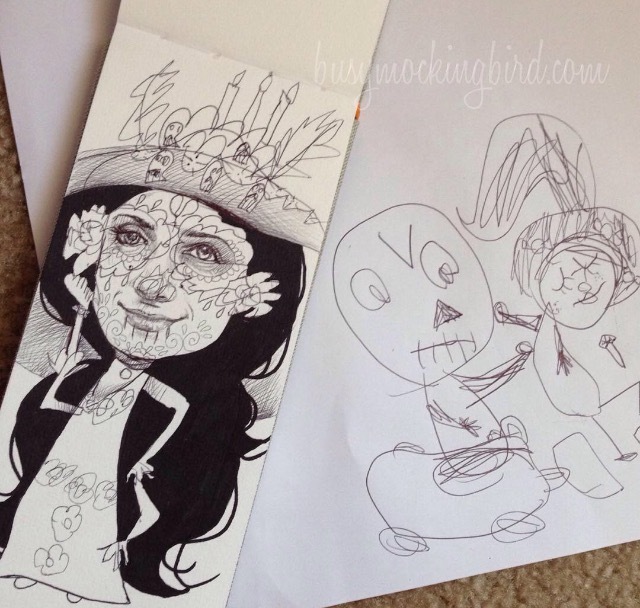 For this one, I let her add on to a doodle I started, turning her into a people-version of LaMuerte from Book of Life, and Myla chose to draw Turbo from Wreck-It Ralph. Day 5: Werewolf. 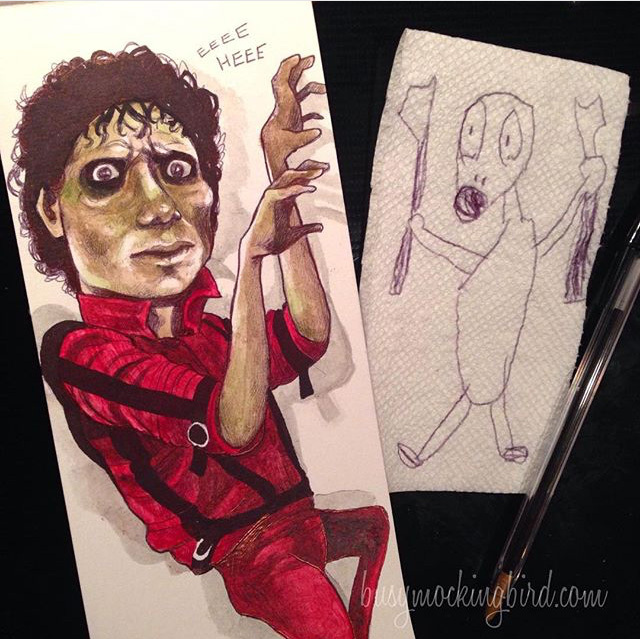 I drew Michael J. Fox as Teen Wolf, and she drew Aisling (a white wolf-girl), from Secret of the Kells. 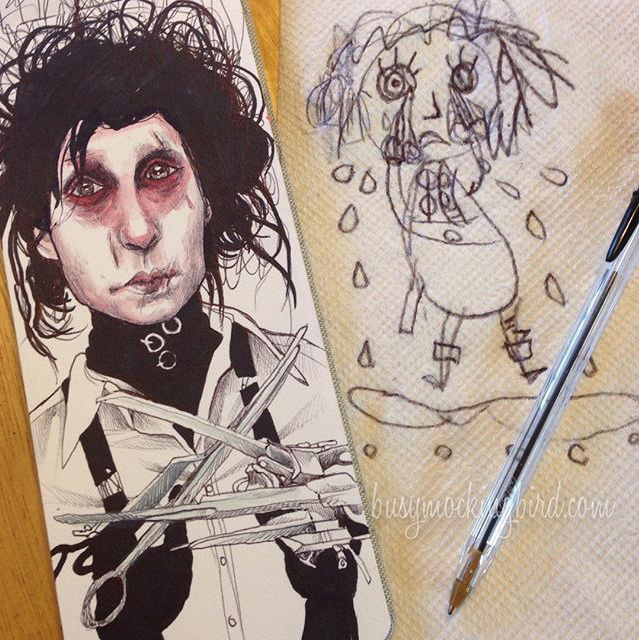 Day 6: Edward Scissorhands. From the minute she saw a photo of him somewhere, Myla thought he was just the super coolest. She’s still too young to watch the movie (she’s pretty sensitive), but she gets the idea. 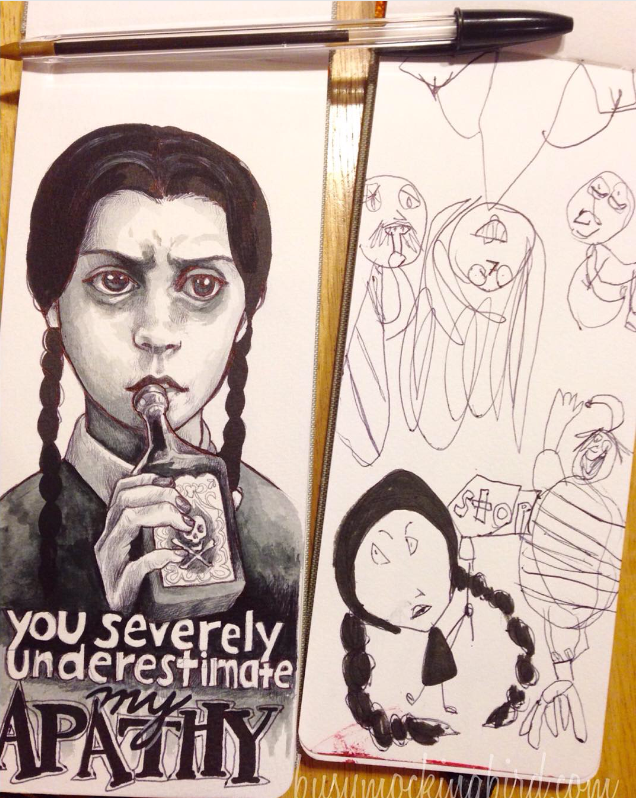 Day 7: Wednesday Addams. Since it was Wednesday, we HAD to draw a Wednesday! Again, she didn’t know who she was, but Myla was digging the idea of a creepy family. 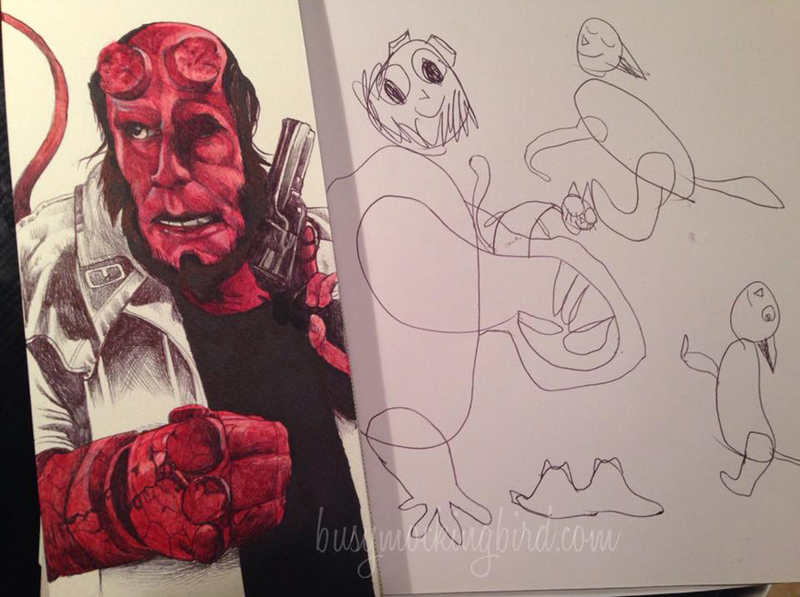 Day 8: Hellboy. Another character she’s never seen in a movie, but loves the idea of. 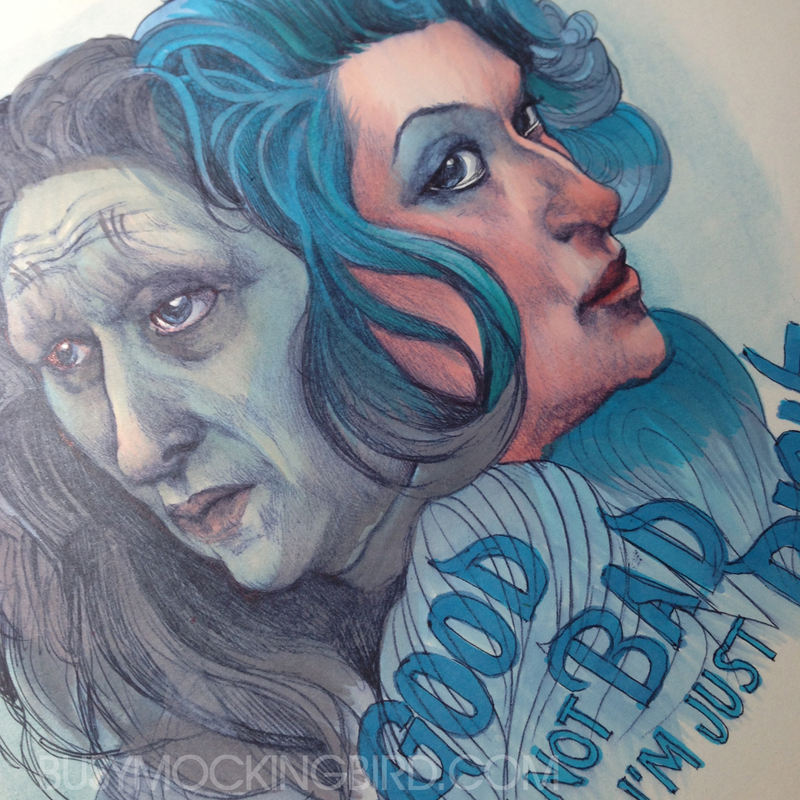 A good guy who LOOKS bad? How intriguing. And he likes cats, too! So thank you again. Thank you. 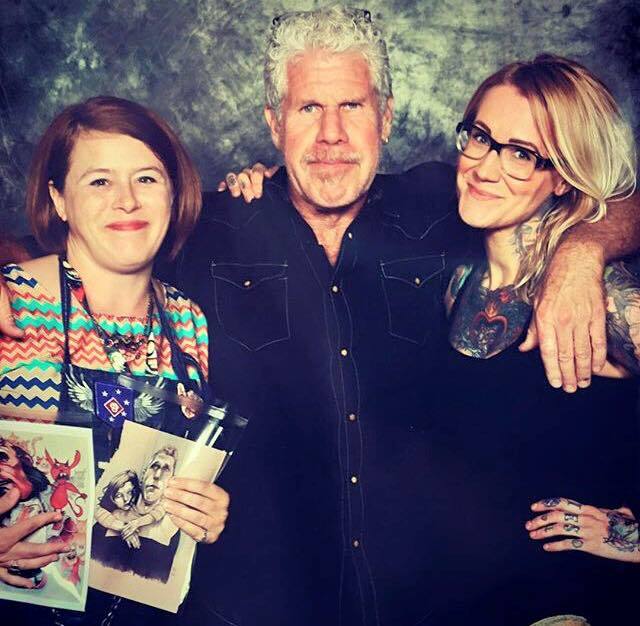 I’m unpacking (mentally and physically) from the 3-day ComicCon, and I’ve got a lot of cool photos to share from it. For now, I’ll mention a fun little aside that came from it. One of the best things about conventions is meeting other people. I’m not so good at the “walking up and making small talk” thing, but I really really enjoy one-on-one connections, and a booth gives you a great chance for that. He said he tried to keep it loose, just whatever he felt like doing every day, just to keep his creative brain going. 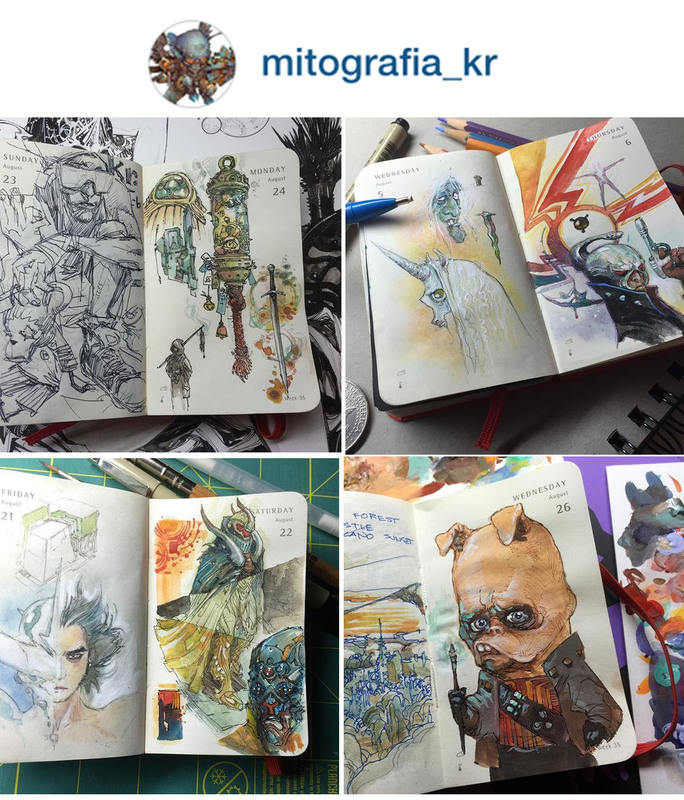 He has a Tumblr, and has just started posting his daily doodles on Instagram. And although I draw every day ANYway, I thought that was a good habit to get back into; maybe carrying a little book around, and not making it so “precious.” Just drawing whatever I wanted, just for fun. 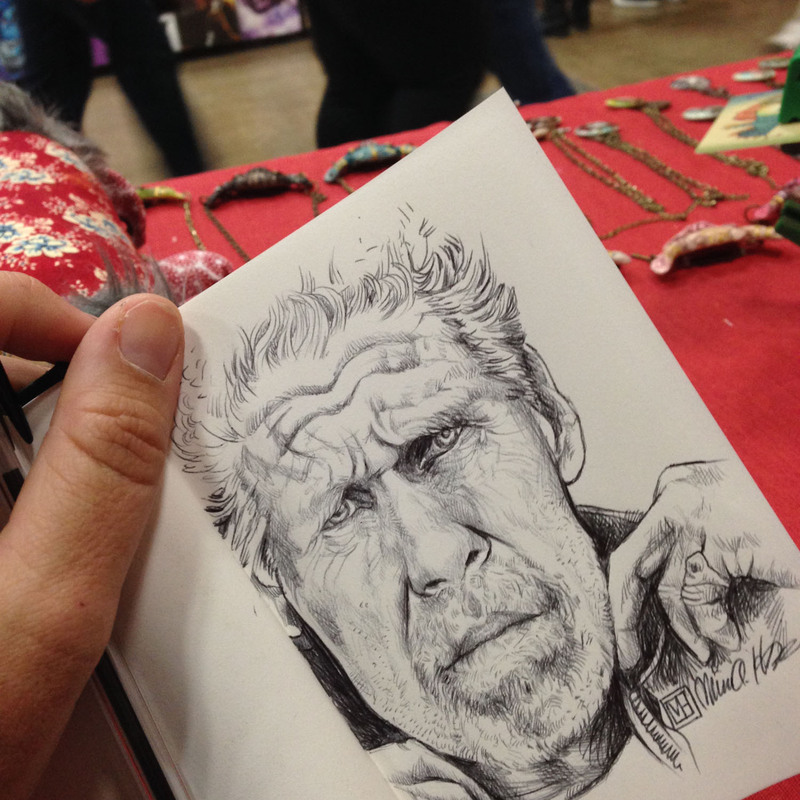 My friend Annie had come to the show to help with my booth, and–inspired by Kenneth’s tiny sketchbook–brought a little sketchbook, and was asking artists to draw in it. Usually artists at conventions will do this for a fee, but some will do it just for the fun of doing it. The day after the convention, my mom and I went to the craft store, and I found these cool little watercolor sketchbooks on sale, and thought I’d try one. 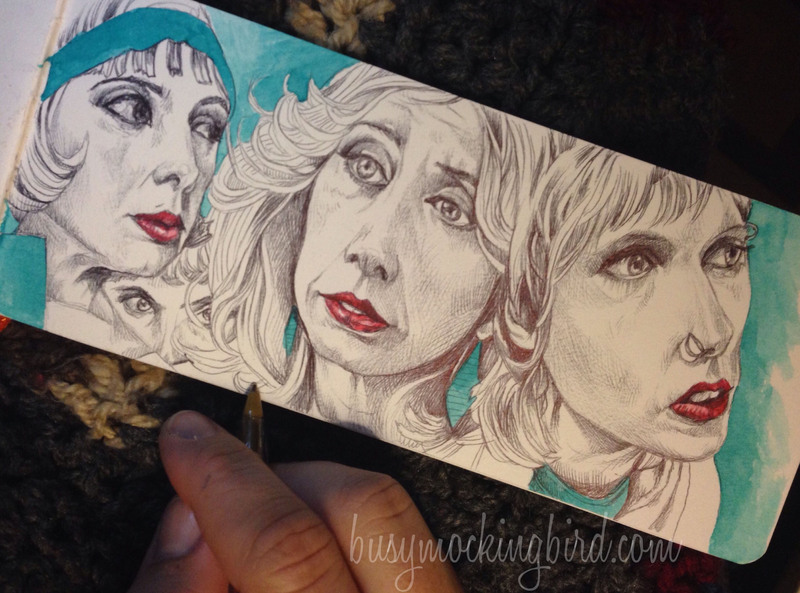 It was longer & thinner, which would make for a more awkward drawing space, which I found to be a fun challenge. 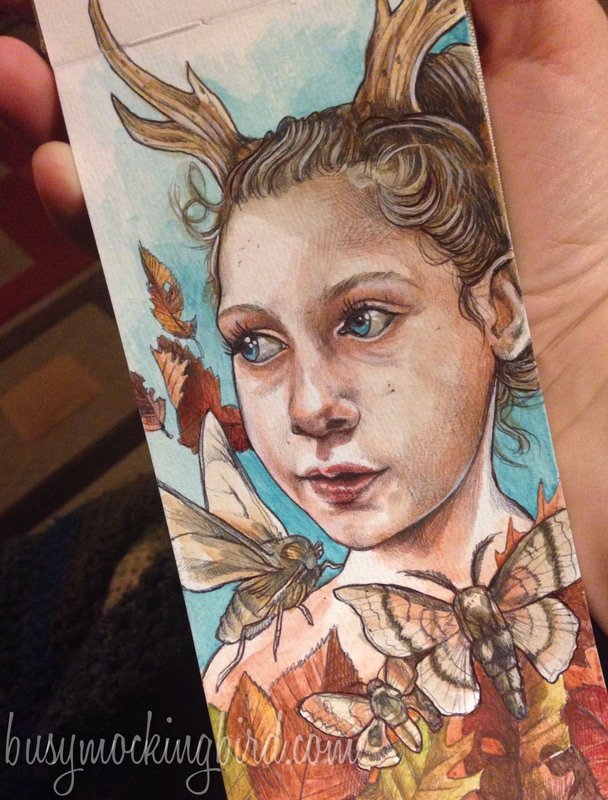 That night, while my mom & I watched movies, I doodled Myla and some autumn moths in a pair of antlers. Anyway, I liked the sketchbook so much, I went back and got more because they were on sale and they were trying to get rid of them. So don’t try to find them at the store in Killeen, Texas, because they’re all gone, I got them. I couldn’t help it, and I don’t even really feel bad about it at all, because they’re awesome, and there weren’t very many of them anyway. Sorry. 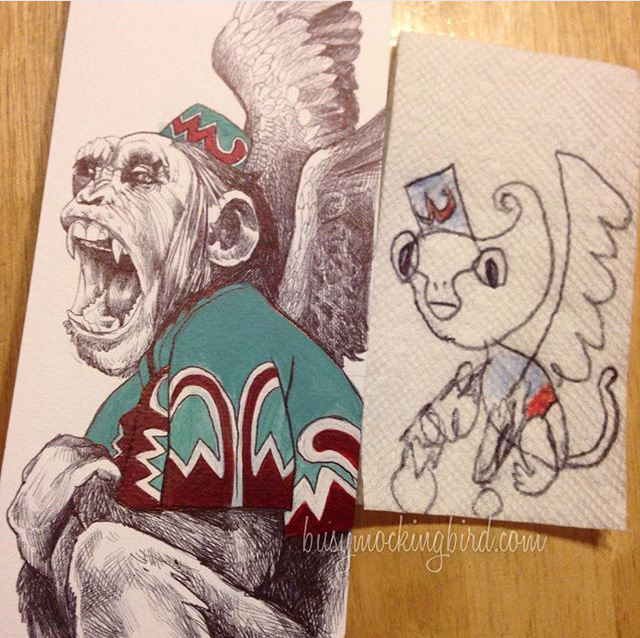 My mom had been giving herself a “drawing a day” challenge to get back into her own artwork, and bought she and my dad one, hoping to get him on board. 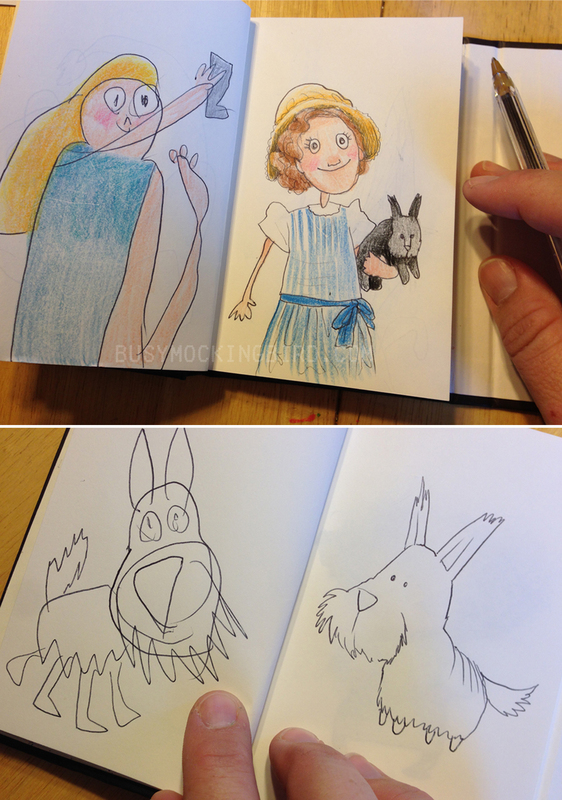 I know another friend, who does amazing things with those drawing prompt books… (I’m talking about you, Kendyl…) I bought one of those books one time, and only ever drew one thing in it: a bulldog in a monocle. So there’s also that. 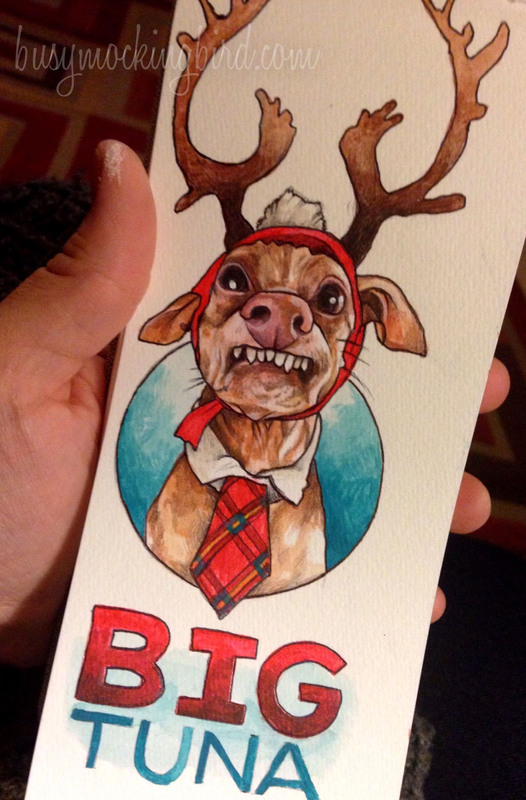 I drew Tuna from @tunameltsmyheart…do you know Tuna? His little face makes me smile. Anyway, there was a contest or a thing about drawing him, and this is what I drew. Because: TEETH. Tuna is all about that mug. 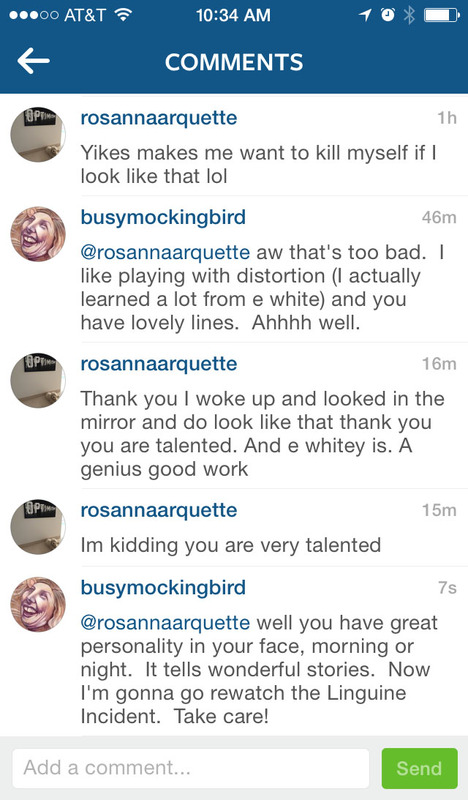 Apparently, though, she saw it on Instagram and didn’t really like it…. And that’s okay, because you know what? I didn’t draw it for her, I drew it for me. I love her lines, and if she’s not comfortable with my version of her lines, that’s alright with me. (sniff). Of course, I’d have loved her to love it, but the thing that makes me enjoy making art is not whether or not someone else likes or doesn’t like it…even someone famous. So don’t be afraid of criticism or judgement. Don’t take that criticism seriously. They’re looking at the front steps without walking into the house. It gets better the further you go. 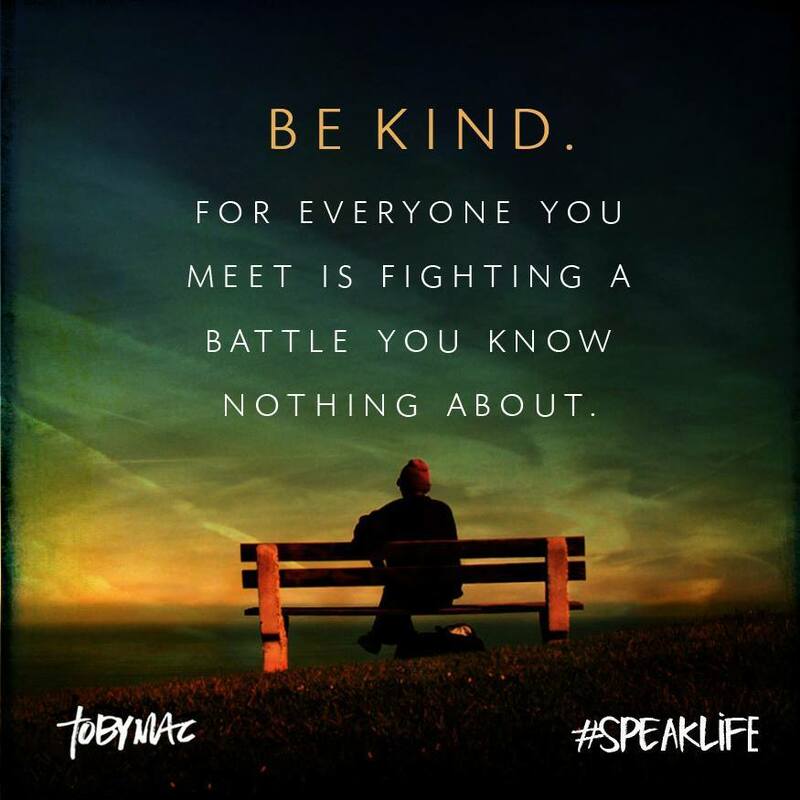 You just have to PRACTICE it…. 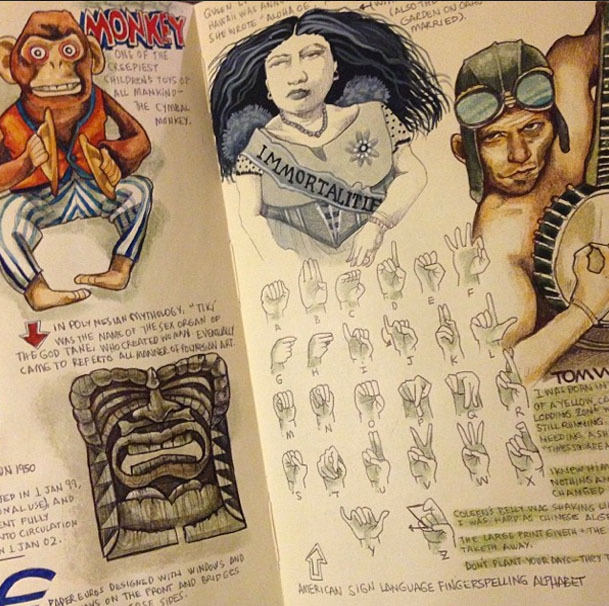 So here’s to new sketchbooks–hooray! I am an “illustrator.” I draw what I like to see, and there’s usually not any “deep” or lofty meaning behind any of it. It’s nearly always taken best with a good sense of humor, never with a serious face. There was that time when our daughter was going through a thing. You know those things? Where they’re nearly insufferable, and they make you crazy because you don’t know how to handle it, and the way you’re handling it isn’t working? And that felt good. Much better than words. And as the days went on, I felt like I had sort of found my general shape, but I was torn into so many different directions, in so many different ways. I was having trouble focusing on priorities, because EVERYTHING seemed like a priority, and everything needed attention. And yet nothing was working the way I wanted it to work. It was hard–It would be SO much easier if you just didn’t CARE, wouldn’t it? But I wasn’t going to give up. After a bit longer, things start to settle down a little. What’s so frustrating is that we’re trying to keep a handle on everything, do the best we can, and raise a happy, healthy kid, and she WON’T LET US. All that stuff my parents said about it “being harder on me than it is you,” is true, and I was only JUST realizing that. I thought of how much attention we give to this one little tiny thing that has such a HUGE impact on our world, and how all you want to do is love it and hug it, and sometimes it just doesn’t WANT that. I thought of two or three or four grown adults and the hoops they jump through for a crying baby or a restless toddler on an airplane, because they just want to calm and comfort that spiny little thing…but sometimes it HAS to pull away. 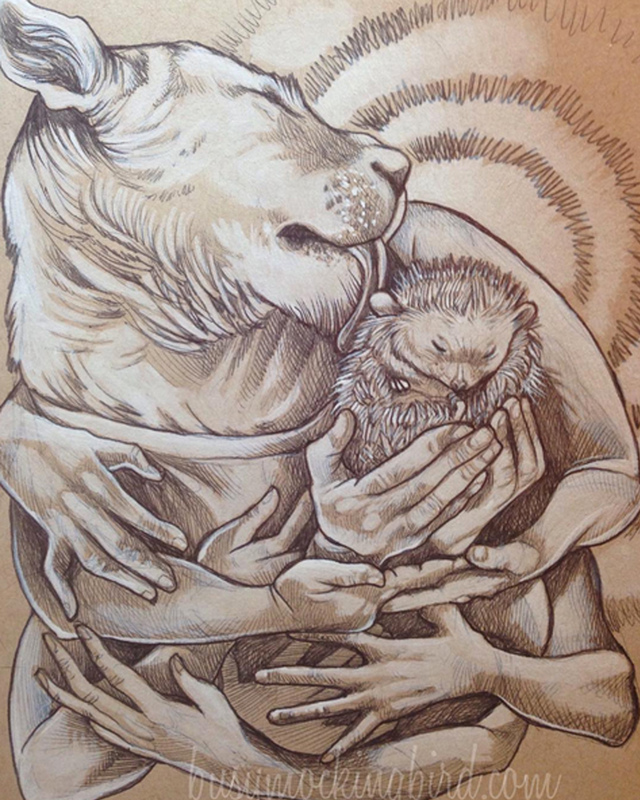 I thought of a mother lion, and all these very attentive hands doing their best to cuddle this small, prickly, spiny creature…. 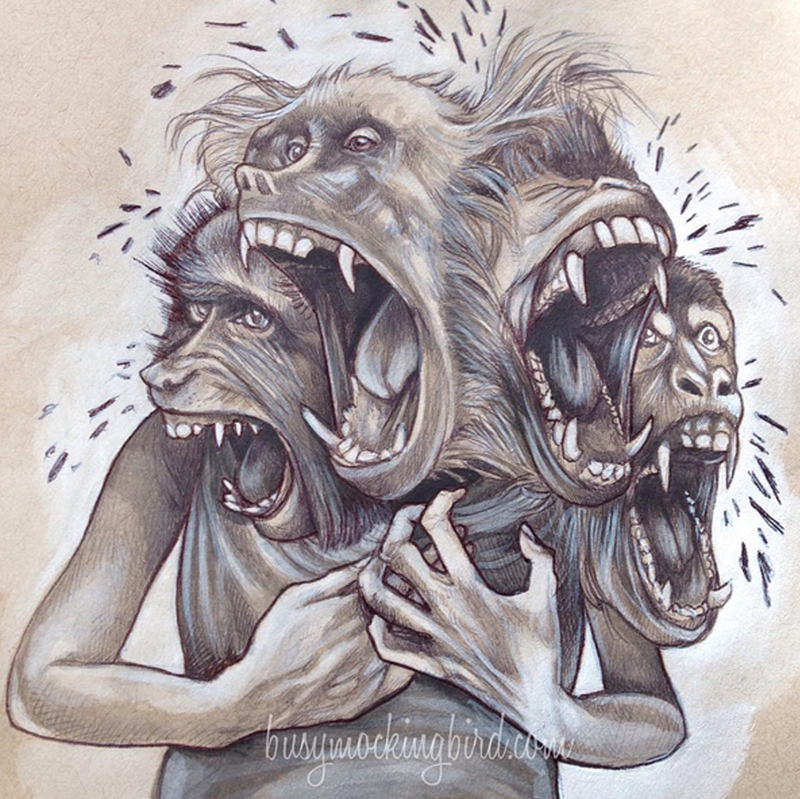 Around this time, I had an experience that reminded me to breathe…that reminded me that I had no control over anything, no matter how hard I bash my head against the wall. That I could do everything that I considered “right” ALL the time (which I realize is impossible), and things could still go terribly wrong. There is no REAL control. And keeping it all in and pretending it’s all fine doesn’t help anyone. And that’s kind of sad, isn’t it? Not a very good way to behave. I thought of all these unpleasant things, these things that weigh on me, that poke and grab at me in a huge dustcloud of shadows, and how I keep telling myself that there’s no time for them right now….that they’re not important enough to spend time on. I thought of them like a corset, giving the false appearance of control, while simultaneously NOT ALLOWING ME TO BREATHE. I thought of trying to cram all that stuff inside while trying to keep strong for everyone else. While trying not to make waves. While trying not to be a burden to anyone. While trying to take care of everyone else. While trying to manage everything and keep it all going. While keeping a calm, brave face because with all that stuff going on, there’s no room for anything else. 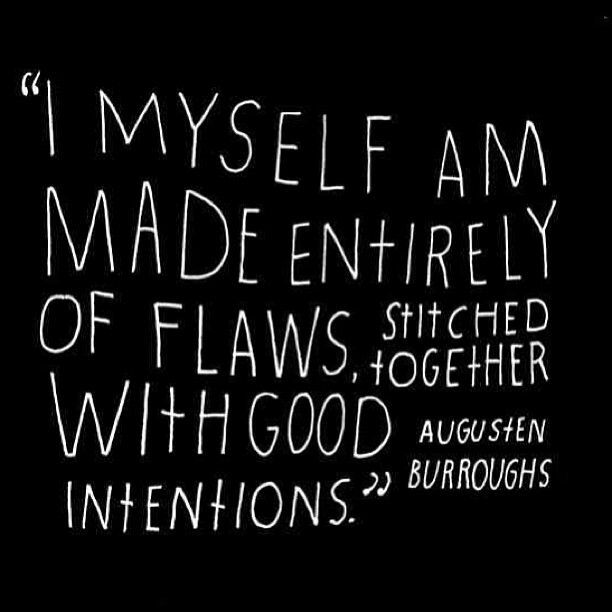 And I’m working on that. And it might not look like much, but it was one of the few times I’ve been able to connect those dots–to help my hands get out what’s in my mind. And it helps make things feel a little better. Art does that for me. Usually, just the act of drawing something (even if I’m emotionally unattached to it) is fairly meditative and calming. But for some people, it’s cooking, it’s sculpting, it’s reading, it’s whatever. So what connects your dots? 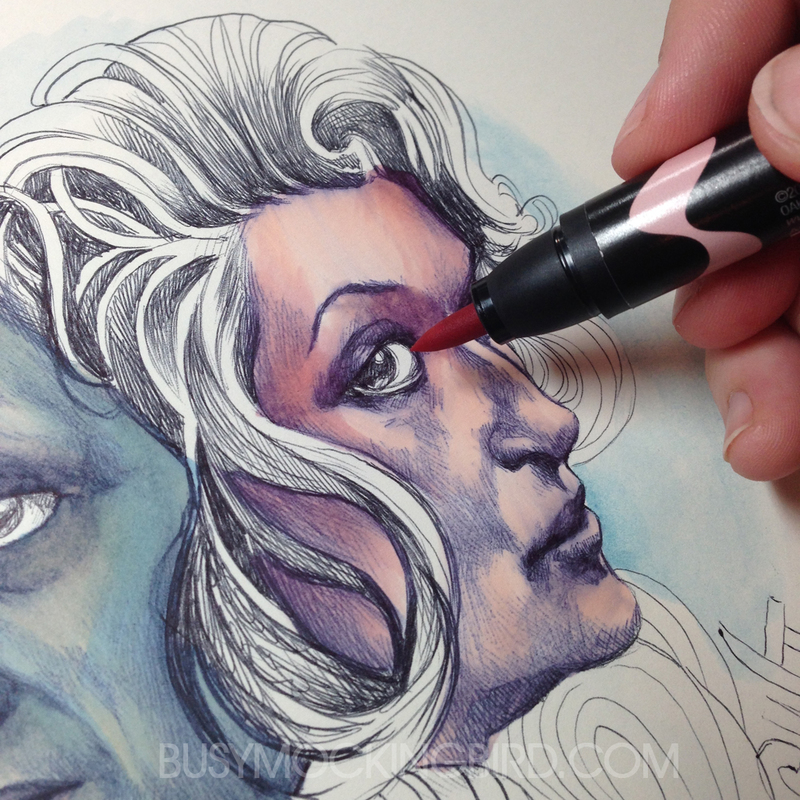 People ask me sometimes about ballpoint pen and how I use it in my drawings. They’ll say that when they use it, it smears or gets discolored. And I say, “that’s because no one in their right mind should be using ballpoint pen.” But I can’t help it–that’s what I like. It’s what I’ve ALWAYS liked, and what I’m most comfortable with. It’s cheap, portable, easy to find, easy to carry. But it does have a couple of issues. I’ve learned that I like ballpoints. Not gels, not rollerballs, not ink pens. BALLPOINTS. Believe it or not, there’s a difference. 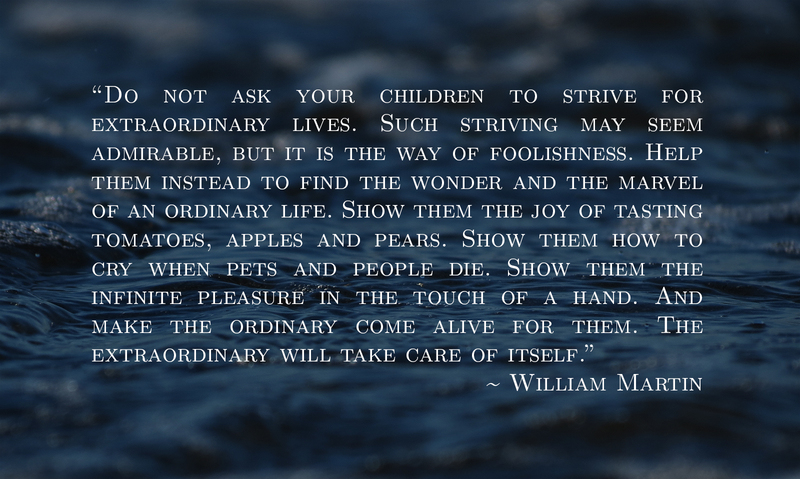 Nothing fancy, either–I’ve tried the expensive ones, and they’re nice, but for my work, they’re not gritty enough. Plain ol’ Bics work best for me…but I’ll use anything in a pinch. I call it “glurping” or “glumping,” or whatever. It’s that blob of ink that sometimes comes out when you’re drawing, that can smear up your whole picture. Early on, I’d be happily drawing and OH NO MY WHOLE DRAWING IS RUINED!!! I know of one artist who uses his finger to wipe the pen every few strokes. I use my shirt….or whatever dark fabric thing is closest. Which is why, if you look all over my house, and on every shirt I own, you will most likely see little constellations of pen dots on my right front shoulders. 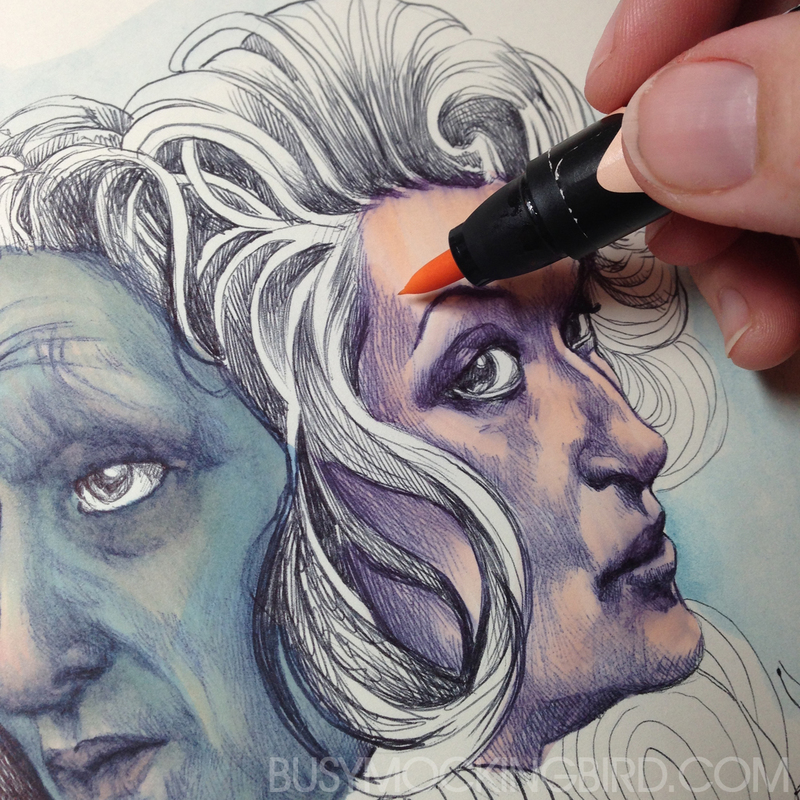 As I draw, every couple of minutes, I instinctively wipe my pen on my shirt in a little twist. Sure, there is absolutely a better way to do this that was not so messy on my clothes. I could use a napkin. But I don’t. 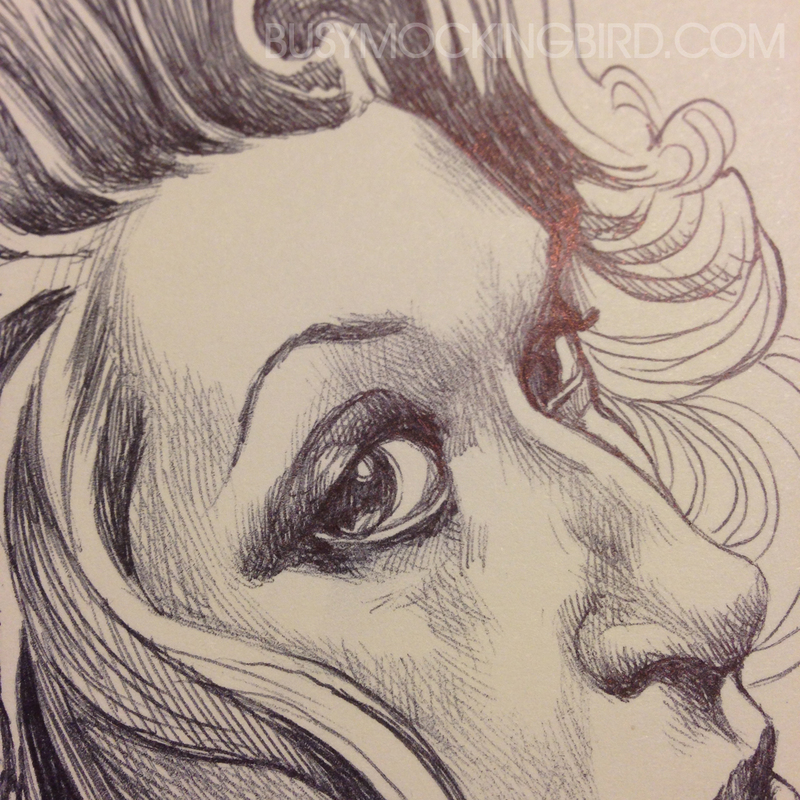 I use ballpoint sketches as sort of a skeleton, because I like the pen marks to show through a little. 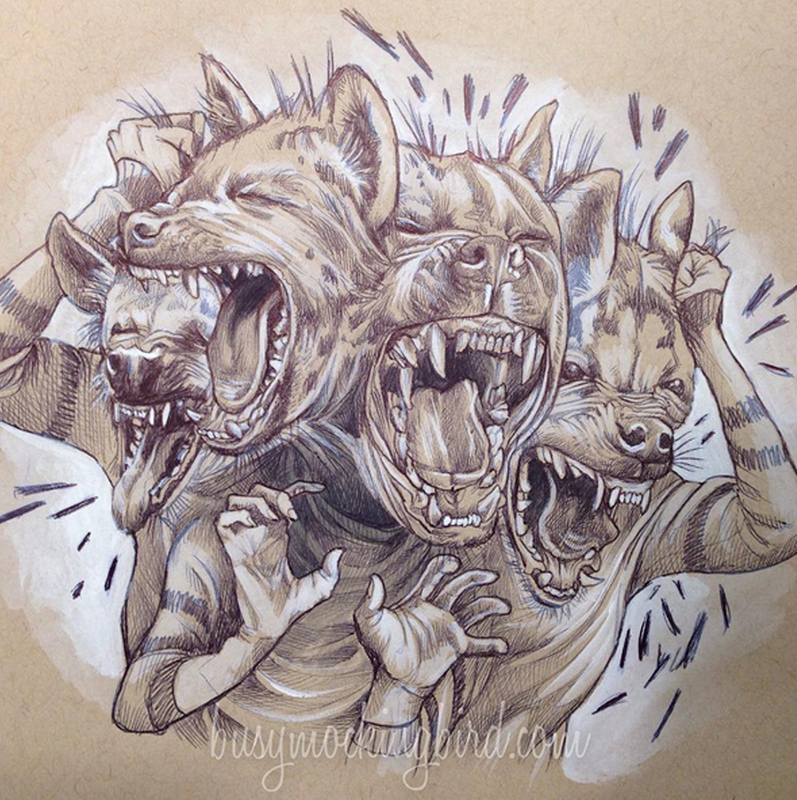 If I watercolor on top, I get this nice blend of ink and pen. 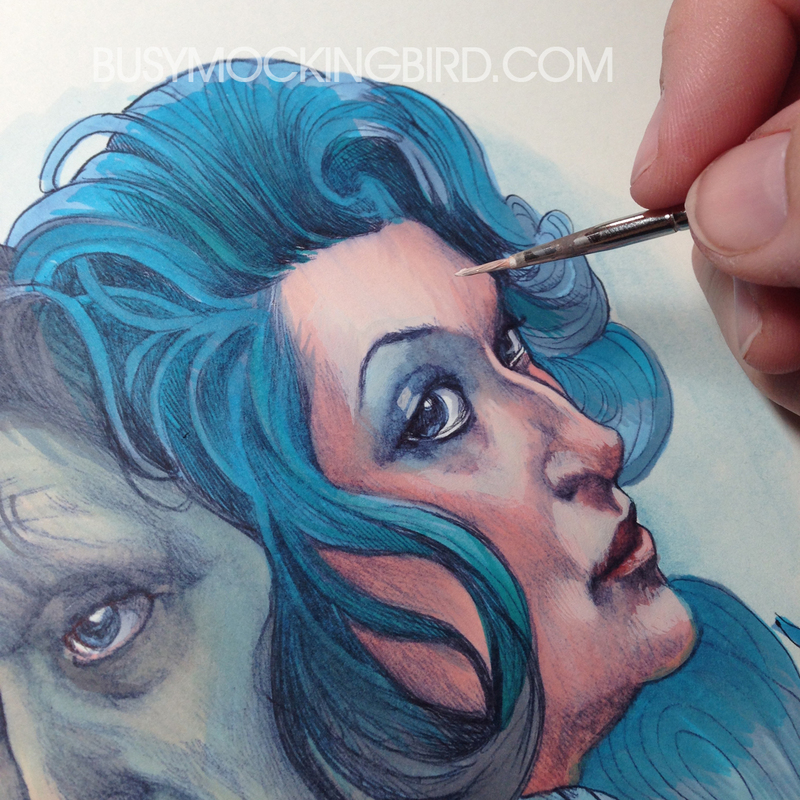 If I use acrylics, you still get to see the great lines, but with painting more on top. BUT IF YOU VARNISH, no matter HOW MUCH acrylic paint I have on top of my pen lines, the pen will SHOW THROUGH. And it turns sort of a purplish color. I’ve tried different varnishes, and I always get the same result. I usually like the look, but if it’s TOO discolored, I wait for the varnish to dry and paint in acrylic back on top of it. Varnish THAT, and you’re good to go. Waste of time? Yes. Draw my undercoat in pencil instead, then? NEVER EVER EVER. Don’t know why. I usually start with the eyes and work my way out. I’ve mentioned before that there are many ways to measure faces to get proper proportions, and while I did my time with that in art school, I prefer to just wing it, because I like the wonky look. Once the sketch is done, I usually use watercolor or acrylic, but for this one, I challenged myself to use markers (since Aaron uses them a lot). 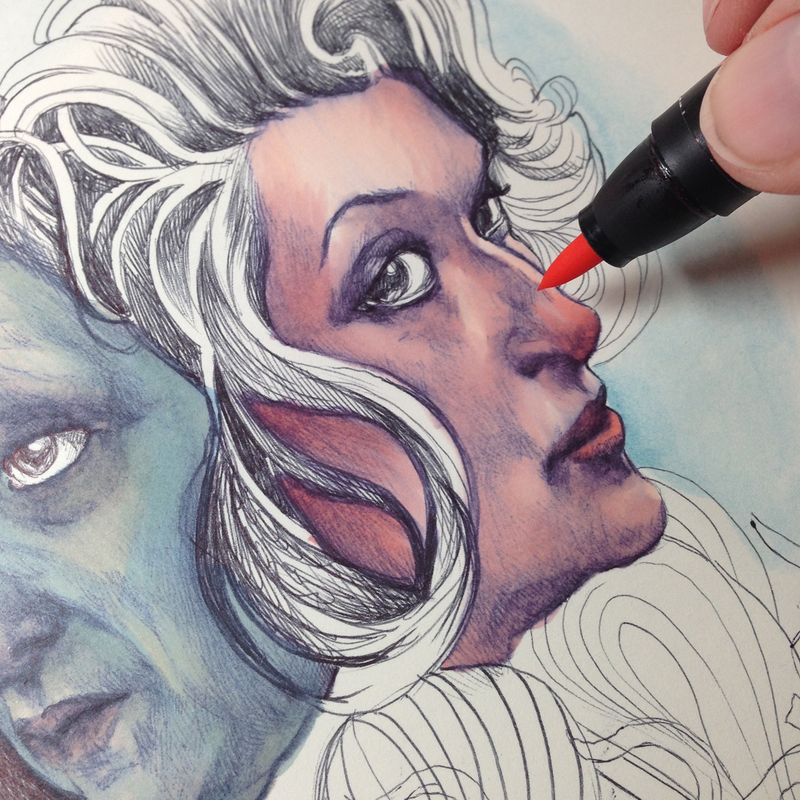 Several people use Copics, but I prefer Prismacolor Premiere Brush Tips for no real reason, other than that I’m comfortable with them, and I love them. And now by the time I’ve blended my darks with my lights, the purple tone is almost as faded as a bad dream in the daytime. Highlights! Here I like to use white acrylic paint (although I’ve used white colored pencil in a pinch) to add highlights to everything to make it pop a little more. I like to find the “hot spots” of white, and blend them into the background color. Don’t be afraid to mess up. Just open that sketchbook and DO IT. The worse that could happen is that you learn something. So good luck with all your artistic experiments!